This summer marks 50 years since my first trip to Boston, which quickly became one of my favorite cities. I came there as a 12-year-old, to attend my uncle Robert’s wedding along with my mother. 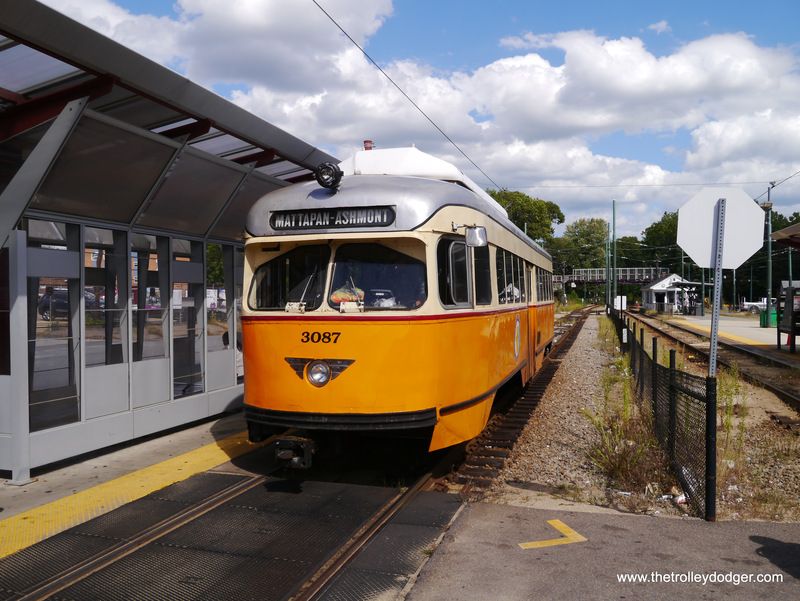 I was astonished to find that Boston still had PCC streetcars, of a type very similar to those Chicago had retired nearly a decade earlier. While my relatives were out making merry, I went off to ride all the various lines. I have returned to Boston numerous times since then. Recently, I spent a few days there to help my uncle celebrate his 87th birthday. 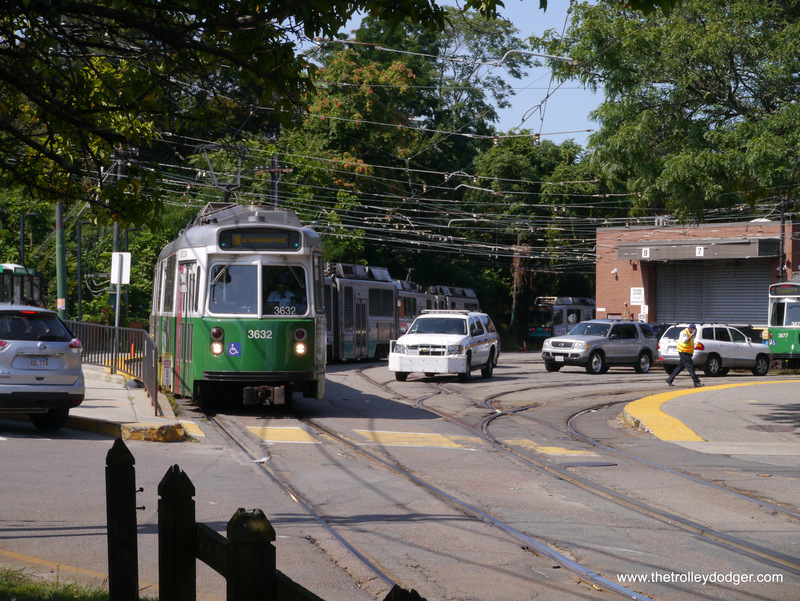 While PCCs are long gone from the MBTA Green Line, a few still soldier on between Ashmont and Mattapan. 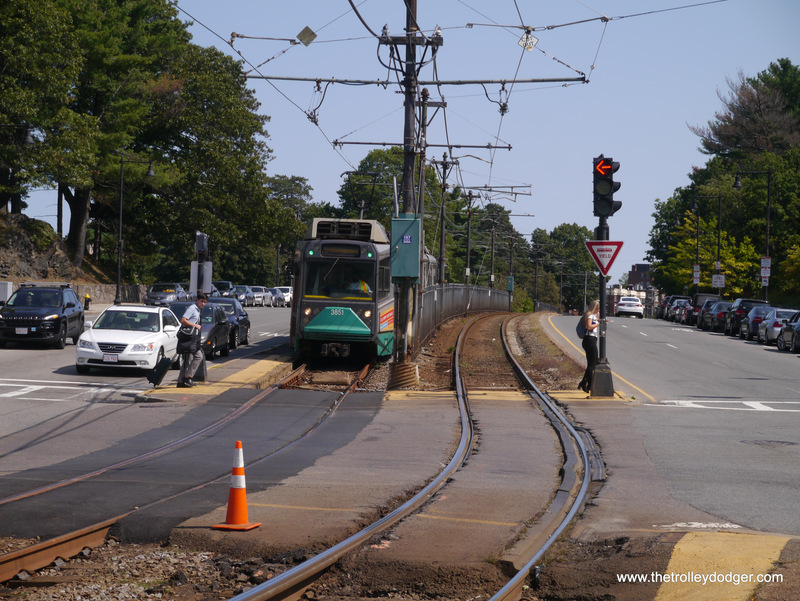 This “high-speed trolley” has been running in an old railroad right-of-way since the 1920s, on private right-of-way with just a couple of grade crossings. 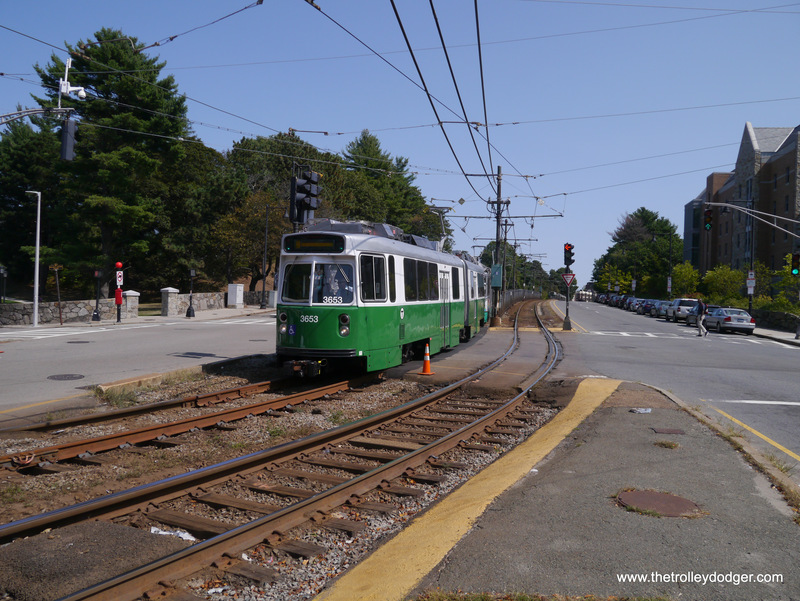 Along with the MBTA’s Riverside line, which began service in 1959, it is considered a forerunner of modern light rail. Although I did not have time to do as much railfanning as I might have hoped, here are some pictures from that trip. 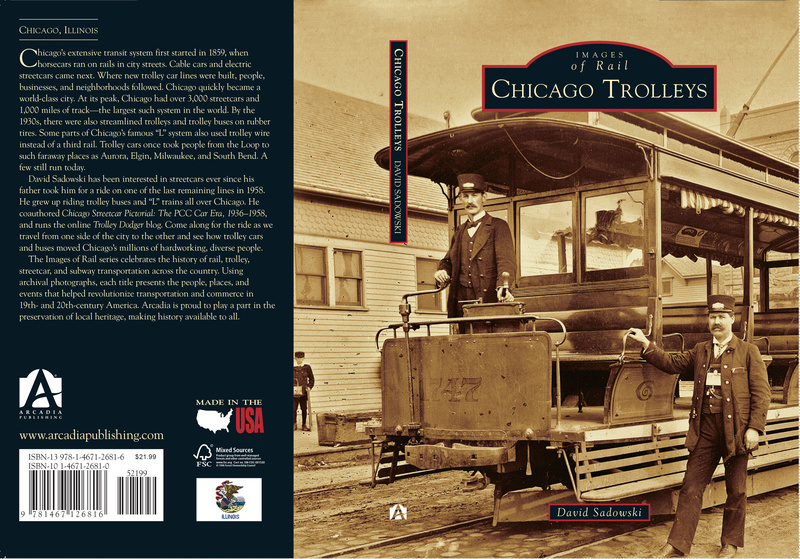 PS- We expect to receive our shipment of Chicago Trolleys books by September 22nd, which should allow us to ship all copies that have been pre-ordered by the release date on the 25th. More information is at the end of this post. 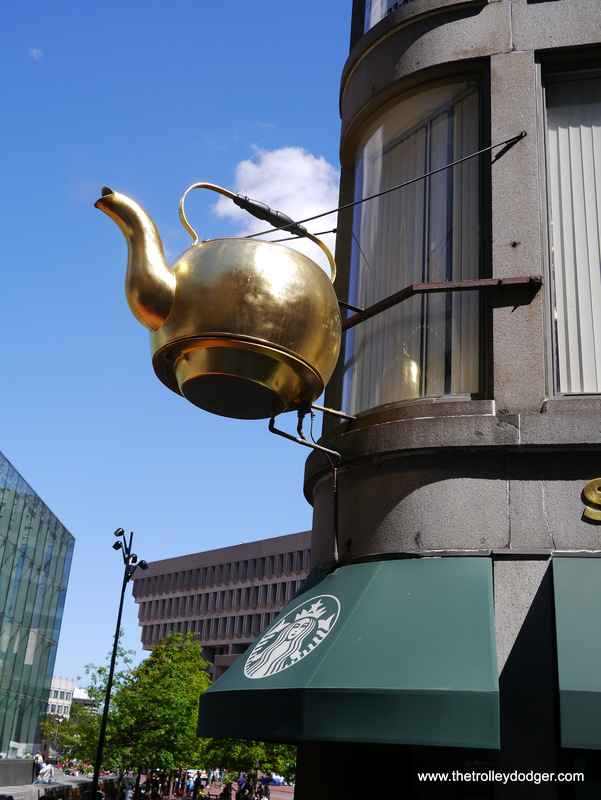 This giant steaming teakettle has been a Boston landmark since 1873. The subway station at Government Center was closed for renovations when I last visited Boston three years ago, but has since reopened. 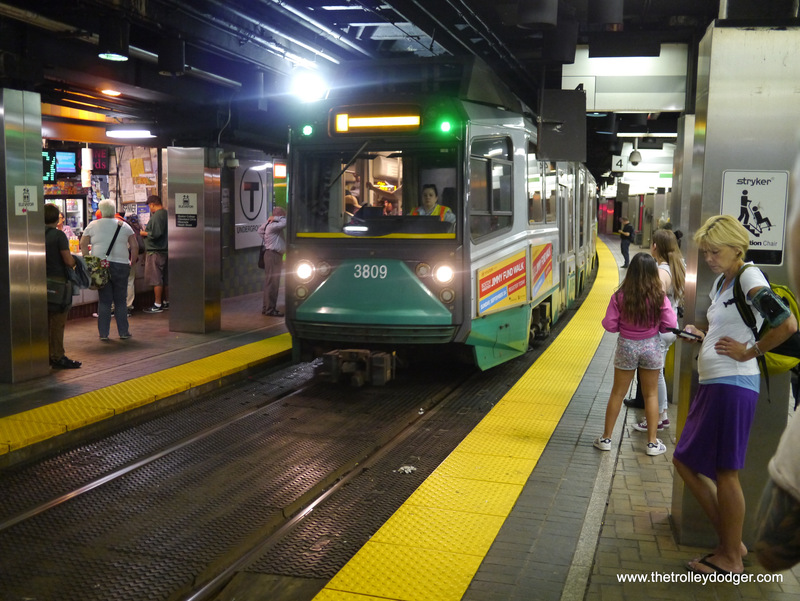 The Green Line subway, oldest in the United States, first opened in 1897. I believe this is Government Center. It’s incredible that this PCC is still in service. 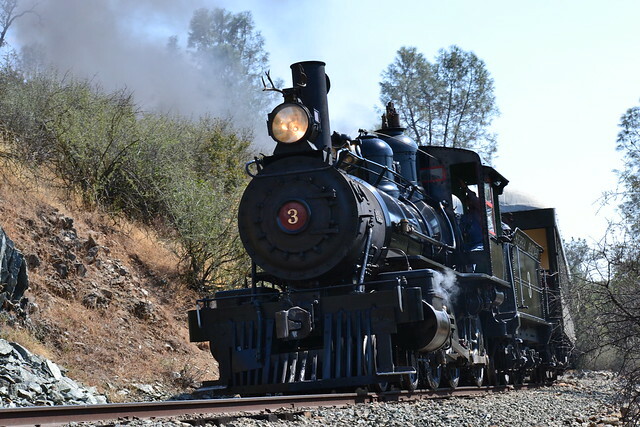 According to Don’s Rail Photos, “3087 was built by Pullman-Standard in 1945, #W6710A. 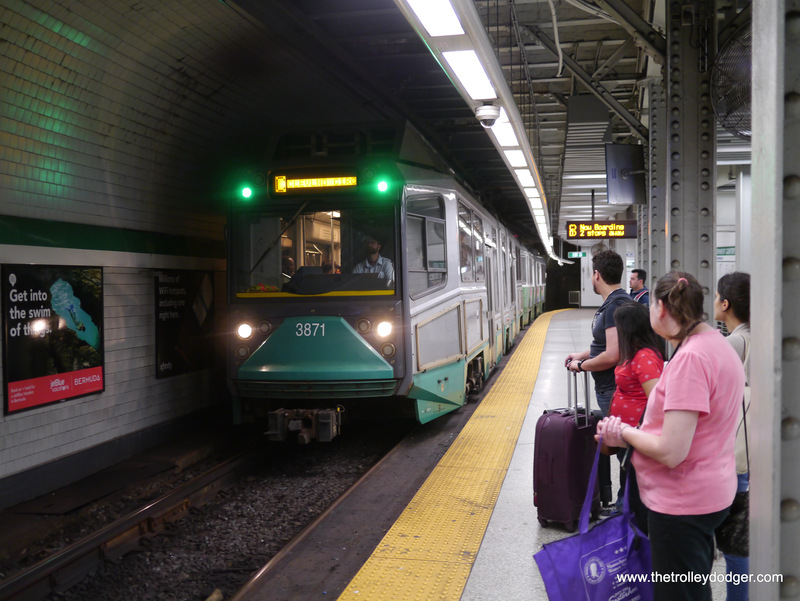 It was rebuilt in 2000 for service.” Here, we see it pulling in to the Ashmont Terminal, where riders can switch to the Red Line subway. 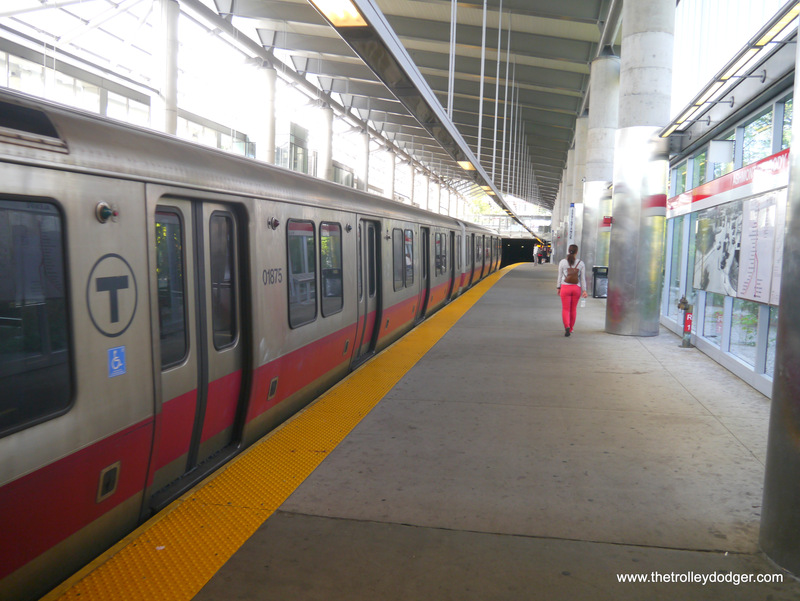 Unlike the other light rail lines, the Ashmont-Mattapan line is considered part of the Red Line. 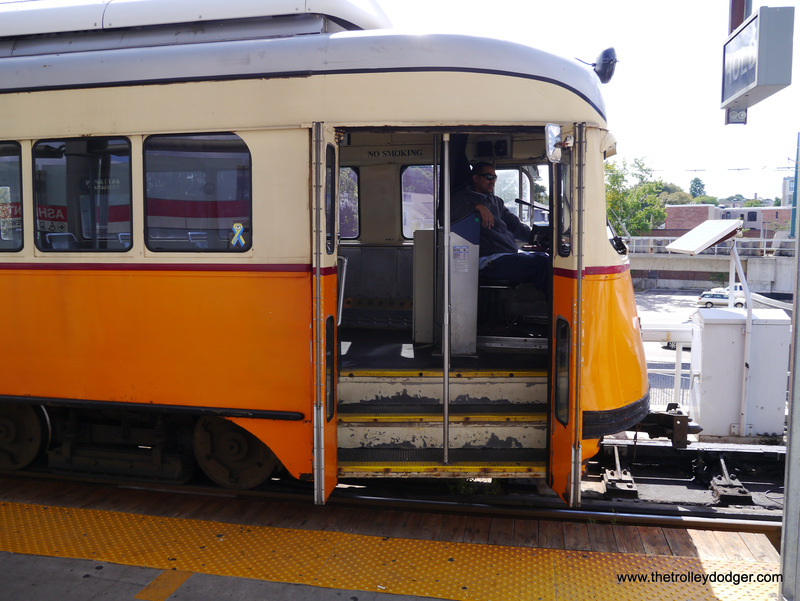 When we were there, it was operating as a free shuttle, although the trains had fare boxes. 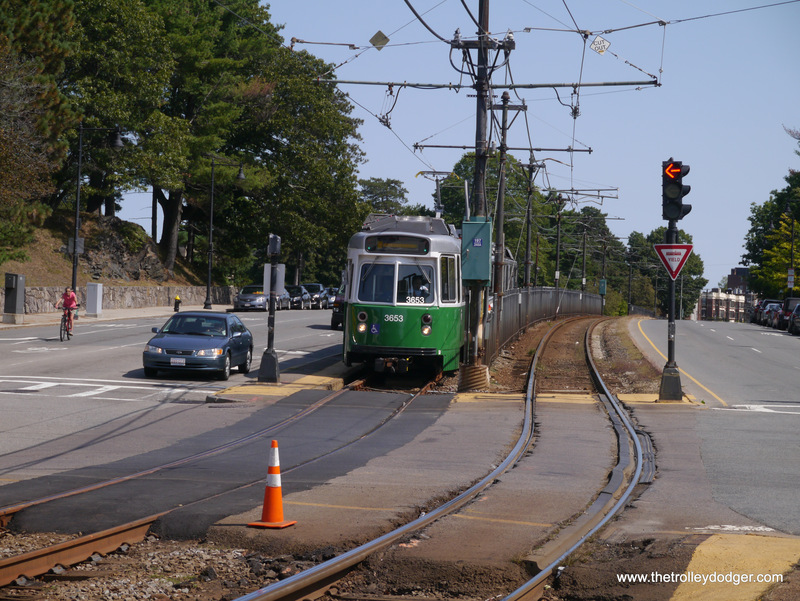 The turnaround loop at Mattapan. The PCCs are not air conditioned, but have forced-air ventilation and sealed windows. The Red Line at Ashmont. 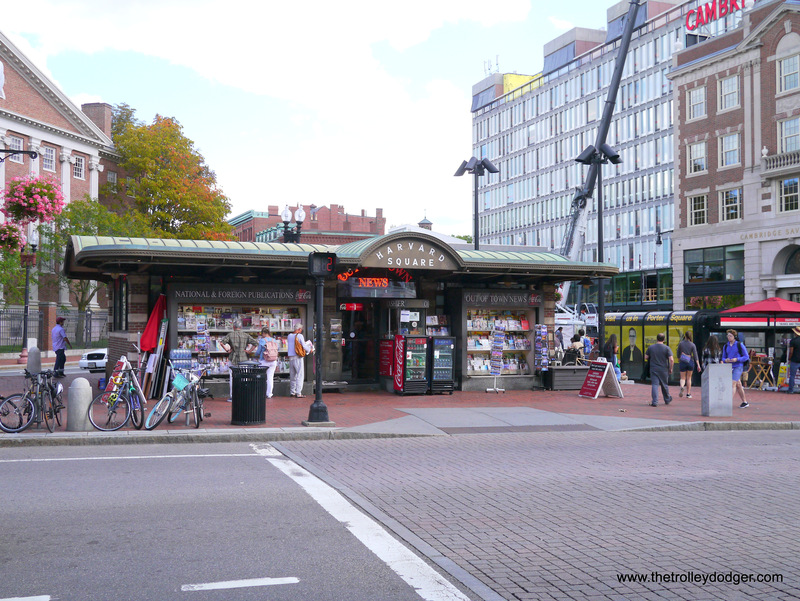 Out of Town News, which occupies the famed former Harvard Square subway kiosk built in 1928, may eventually be forced out as part of a redevelopment scheme. 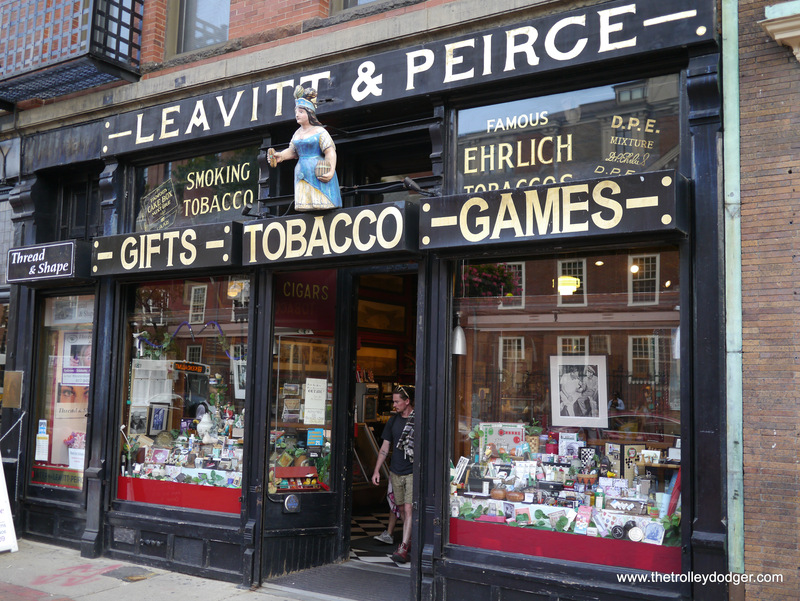 A trip to Harvard Square would not be complete without visiting Leavitt & Peirce, which has been there since 1884. 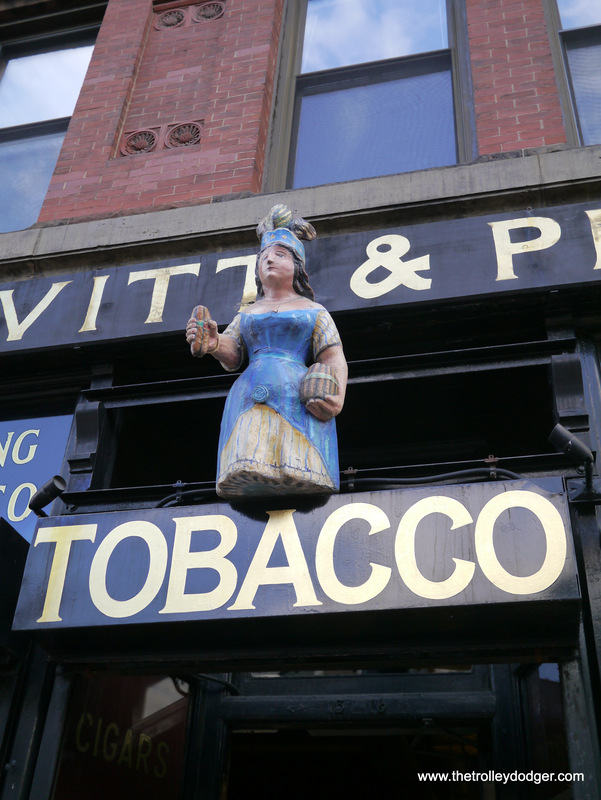 This “cigar store Indian” princess graces the store’s entry way. 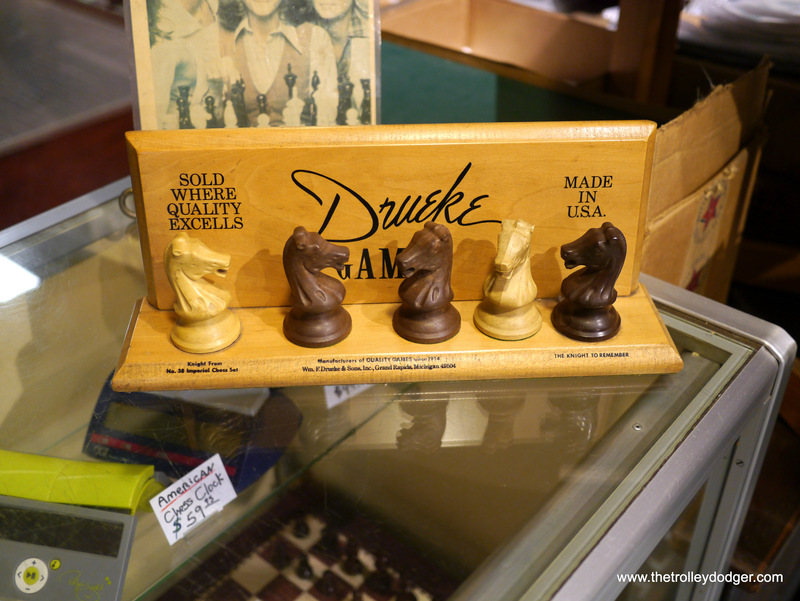 Besides cigars, they sell chess sets at Leavitt and Peirce. 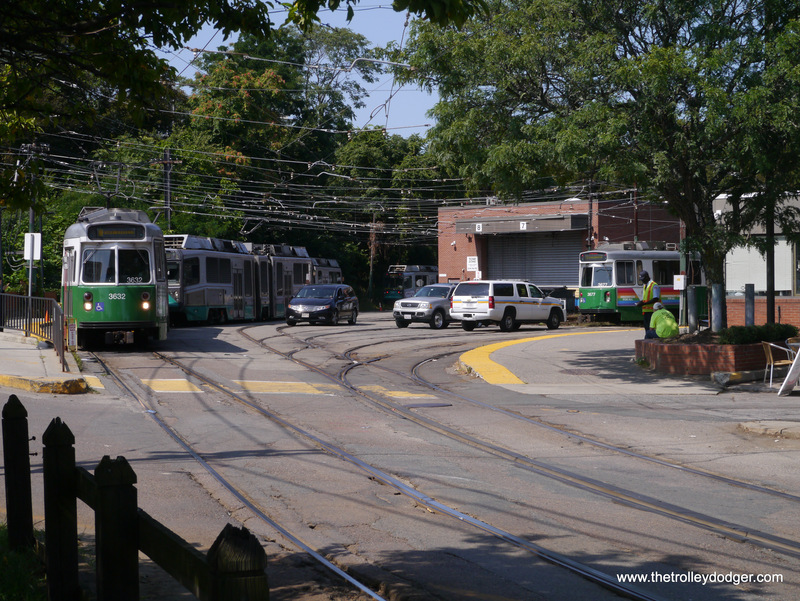 The Green Line at Park Street, where you can switch between the B, C, D, and E branches or change to the Red Line. 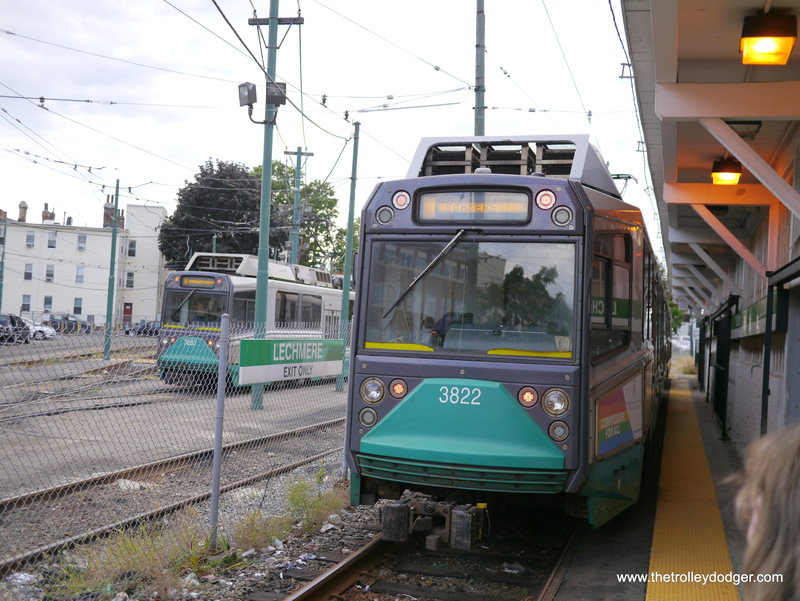 Currently, the Green Line’s northern end is at Lechmere, although there are plans to extend it another 4.7 miles to Somerville and Medford. 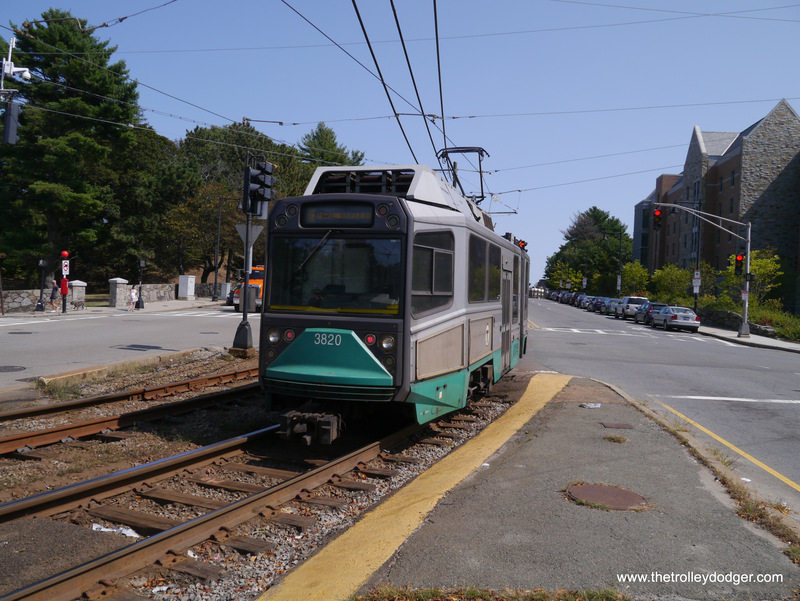 These “Type 7” LRVs were built between 1986 and 1997, and have been rehabbed since I was last in Boston three years ago. Now they are all paired in service with the newer Type 8s, which are handicapped accessible. 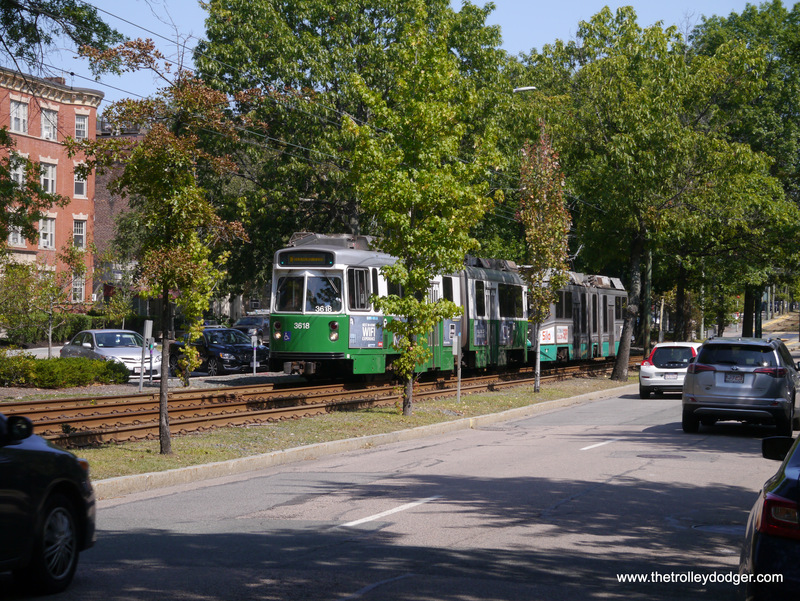 On our way to Logan airport, I had time to take a few shots at the west end of Green Line route “B,” which goes to Boston College. 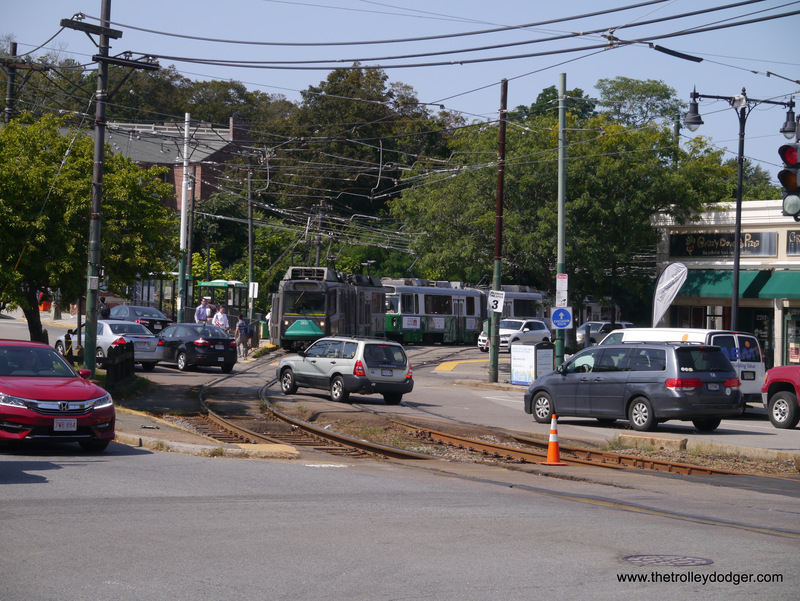 My final MBTA shots were taken near the west end of Green Line route “C”, which is Beacon Street. 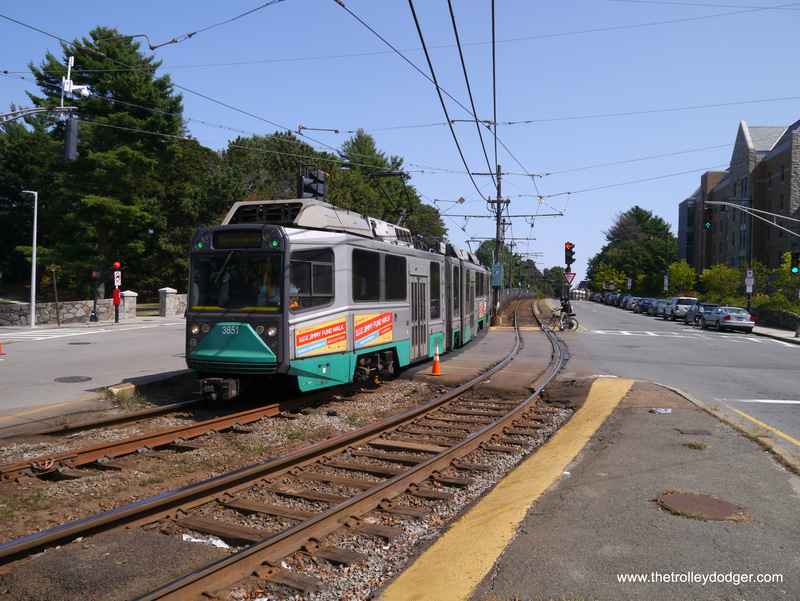 It is a bit confusing that the B line runs on Commonwealth Avenue, while the C line is on Beacon. But the lines were assigned letters due to their position on maps. 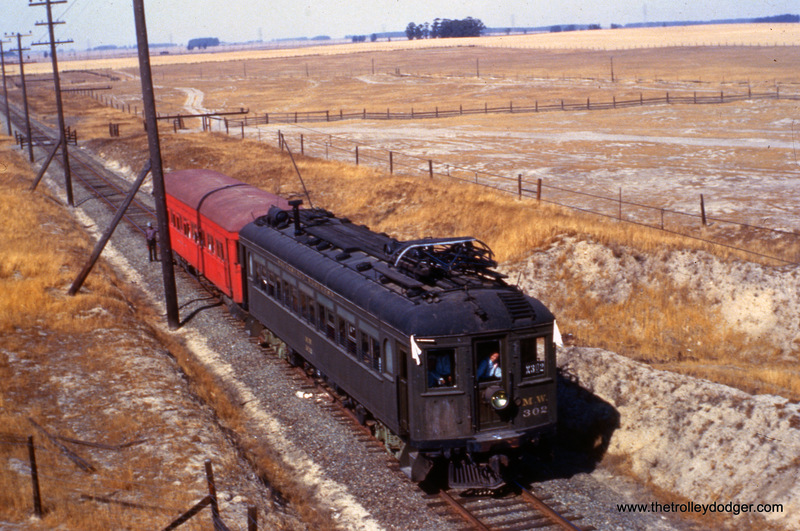 Watertown was assigned “A” as it was furthest north, but rail service there was abandoned in 1969, before the letters were used on any roll signs. 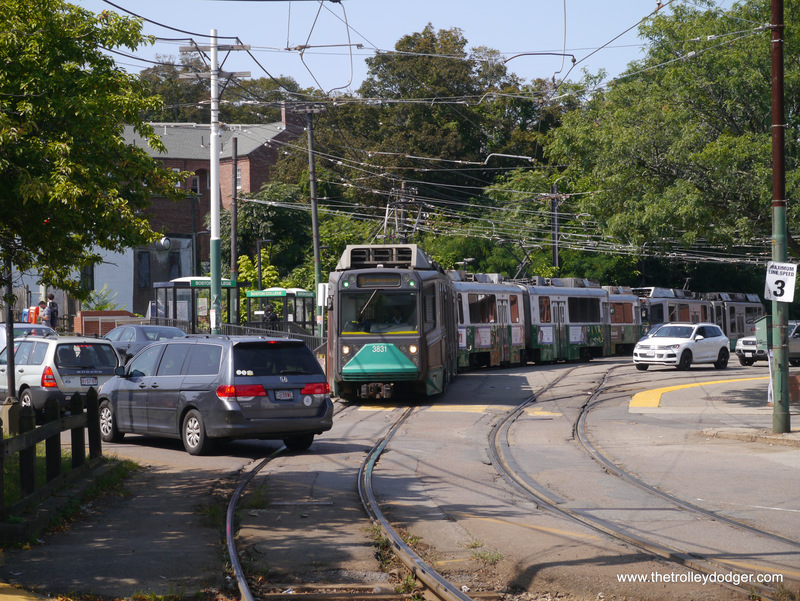 The best explanation for why Watertown got bussed is that streetcars had to go against traffic on a one-way expressway feeder ramp that became a real bottleneck. 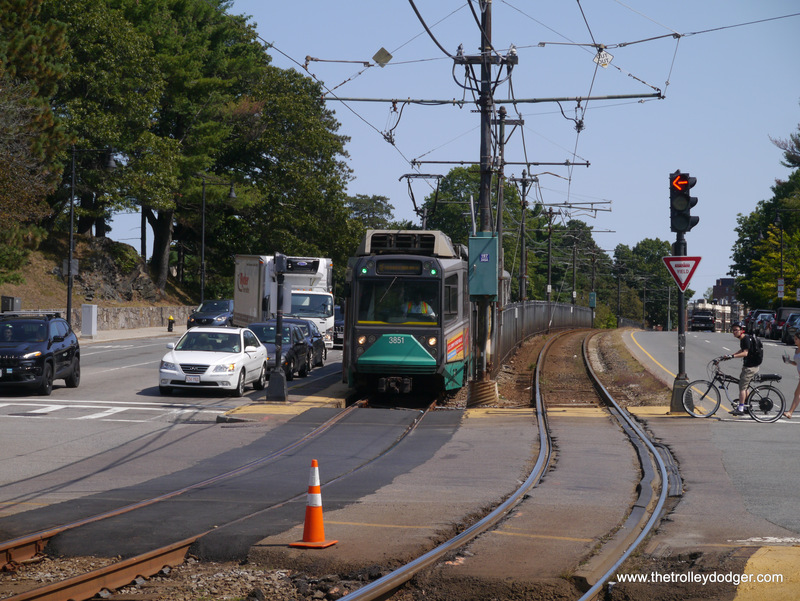 It was easier to re-route buses around this, although the tracks and wire remained for many years for access to Watertown Yard. 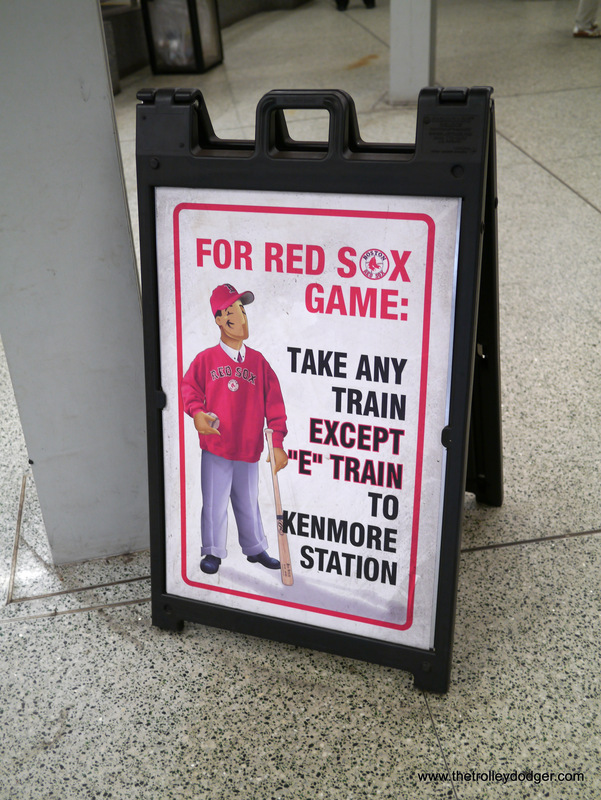 There is a station called Fenway on Boston’s Green Line, but that’s not where you want to go to see a ballgame. 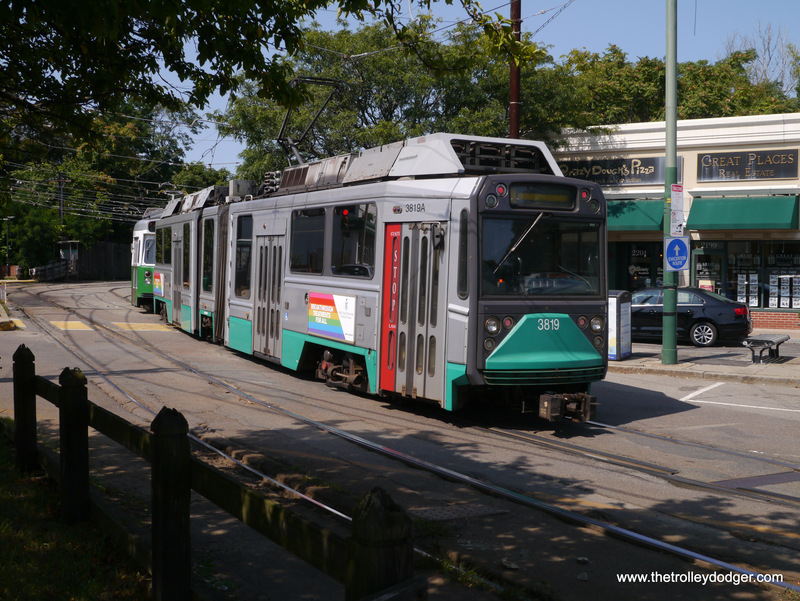 Kenmore Square is closer, and three of the four Green Line branches stop there. 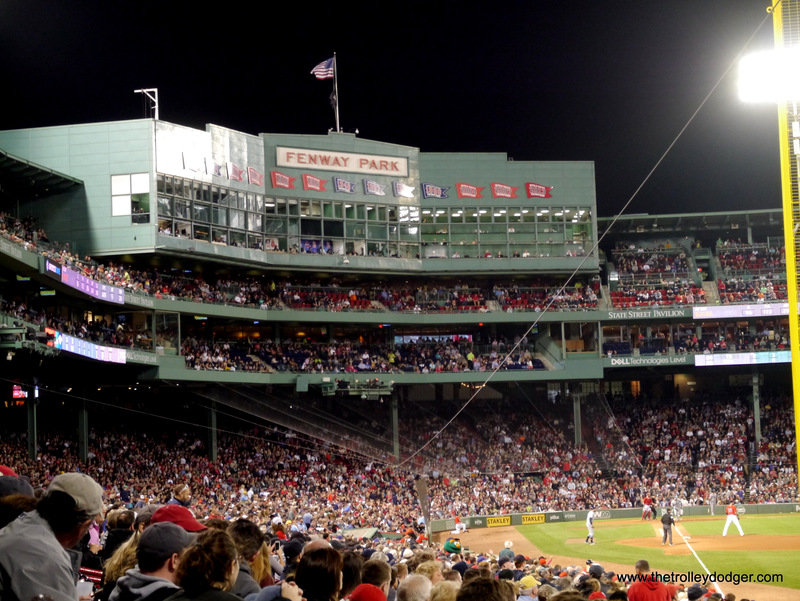 It’s been 40 years since I first visited Fenway Park. On this night, the Red Sox defeated the Tampa Bay Rays, 9-3. 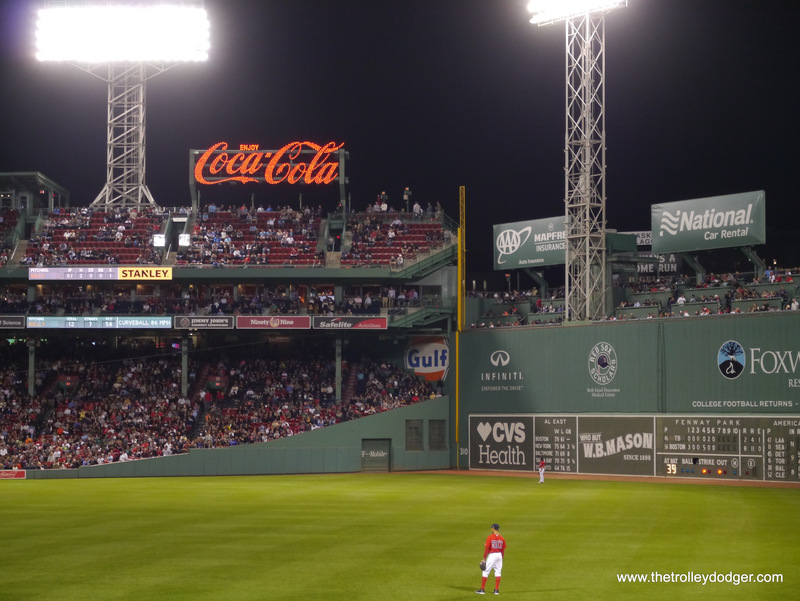 Fenway is one of the most beloved ballparks in Major League Baseball, in part because of its 40-foot “Green Monster” wall in left field. 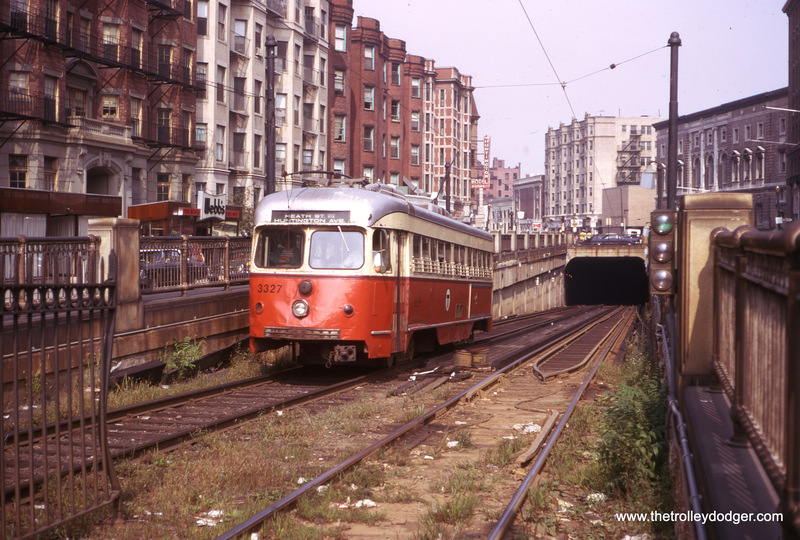 Boston double-end PCC 3327, signed for Heath on the MBTA Green Line “E” branch (formerly called Arborway), is heading up the Northeastern Incline from the Huntington Avenue Subway in this March 1974 view. A period illustration for the M.T.A. song (aka Charlie on the M.T.A. ), see Comments below. 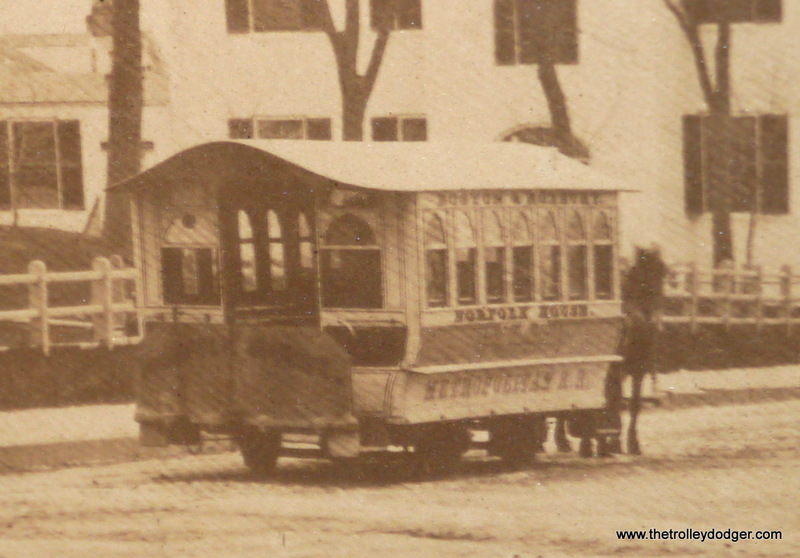 While visting the Simon Willard House and Clock Museum, I was intrigued by this early photograph, which shows a horse car near the First Church of Roxbury. The picture was dated as “circa 1910,” but must have been taken many years before that. A close-up of the photo, showing a horse car on the line to Norfolk House, operated between Boston and Roxbury by the Metropolitan Railroad Co., which operated between 1856 and 1886. 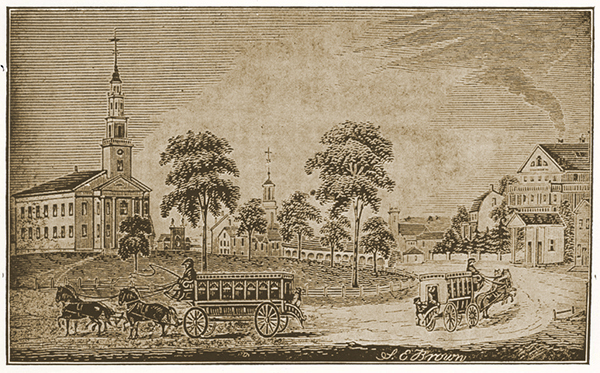 While researching when the above photograph could have been taken, I learned quite a bit about the early history of public transit in Boston. 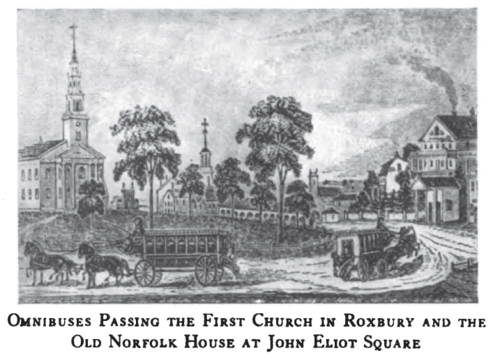 Roxbury was once its own municipality, but was annexed into Boston in 1868. Before horse-drawn streetcars, there was the “Omnibus.” This was a large passenger coach, similar to a stagecoach, that ran on a fixed route between Boston and Roxbury, and offered frequent service (hourly, in some places). This ran from 1832 until 1856. 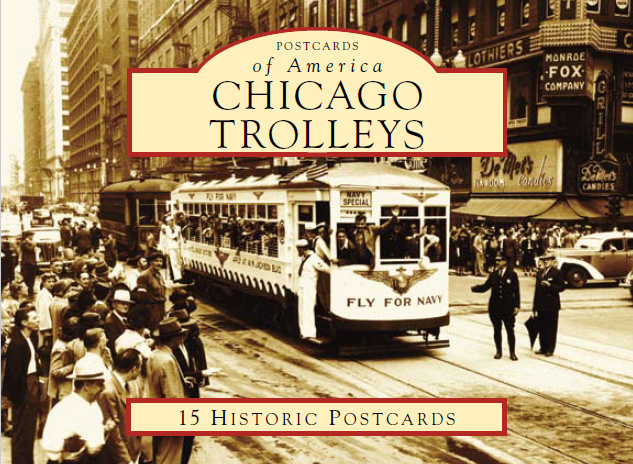 Streetcars offered some advantages, as they ran on tracks laid in city streets, which were frequently unpaved in this era and could be turned to a muddy mess when it rained. Often pedestrians would walk along the middle of the tracks. The Metropolitan Railroad Co. continued to operate horsecars until 1886, when it was bought out by the West End Street Railway Co. Thus, the dates when this photo could have been taken are probably between 1856 and 1886. 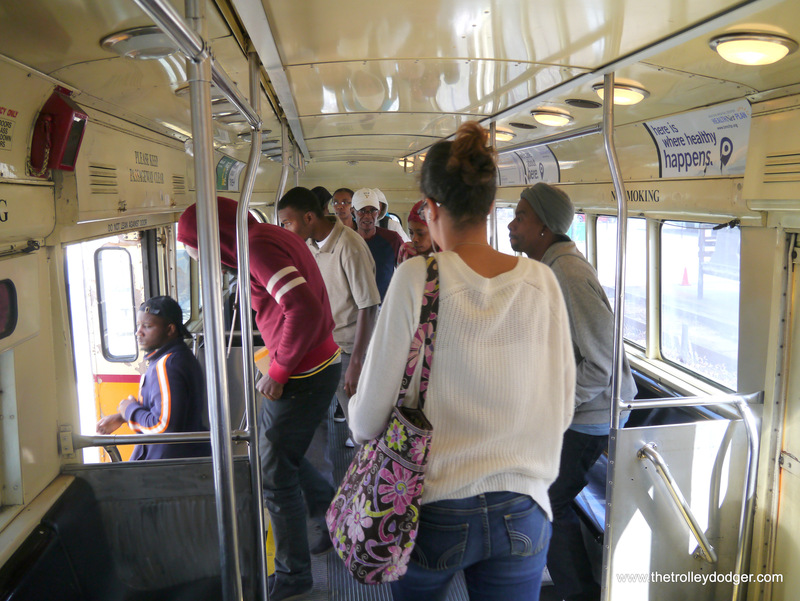 West End sought to improve service and reduce costs. 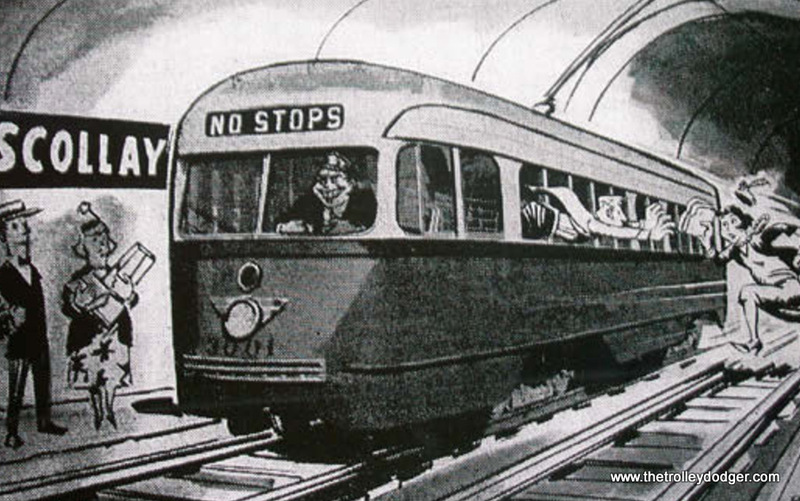 After looking into the feasibility of building cable car lines, the railroad became aware of a new invention, electric streetcars. 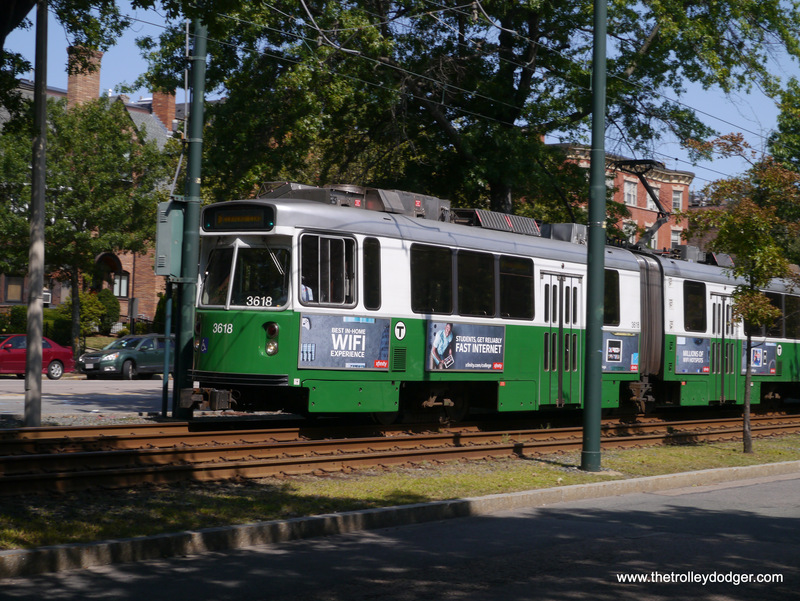 After examining Frank J. Sprague’s pioneering operation in Richmond, Virginia, the West End introduced electric streetcars to Boston in 1889. I was unable to find a definitive date when horsecars stopped running in Boston. The various dates I did find were 1891, 1895, and 1900. But the latter seems unlikely. 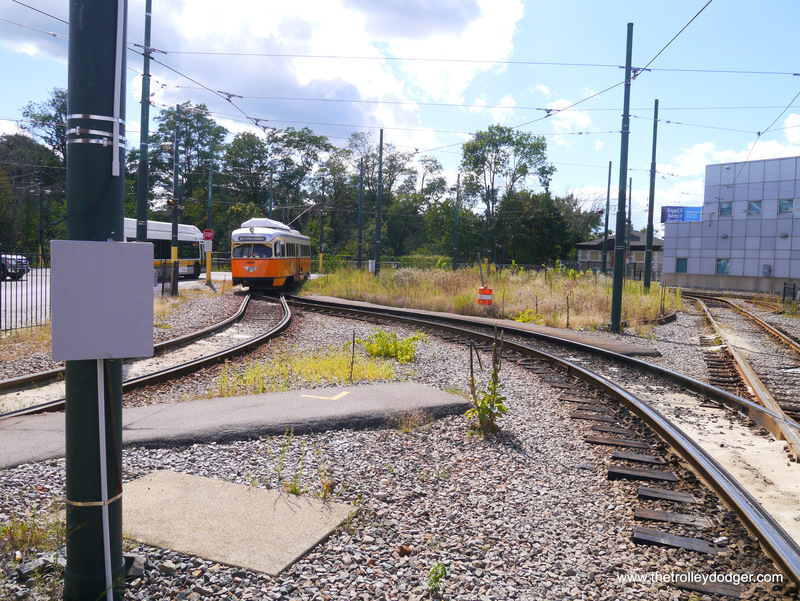 During construction of the open-cut MBTA Orange Line in the 1980s, which replaced an elevated, the former site of a Metropolitan R. R. horsecar barn was excavated, and thousands of artifacts recovered. You can read a full report here, in someone’s masters thesis. 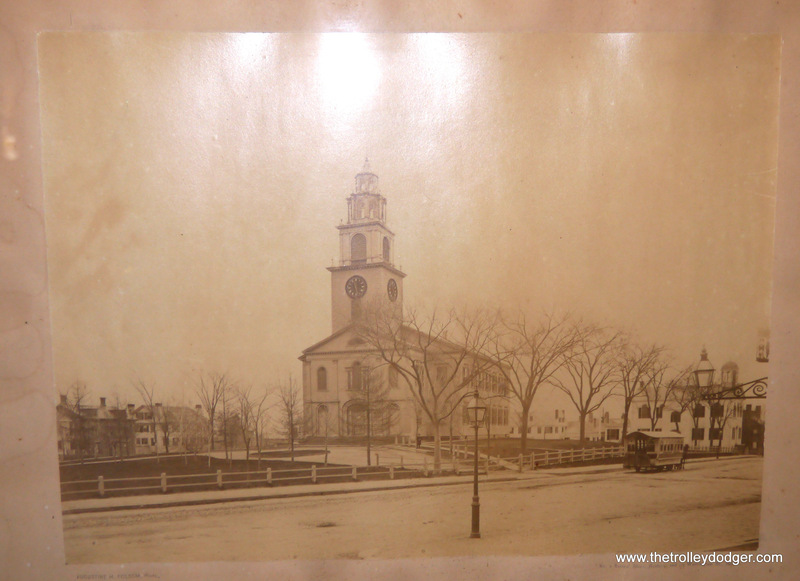 Interestingly, the First Church of Roxbury building, which dates to about 1804, is still there, although the steeple had to be replaced after it was damaged by rough weather in 1954. 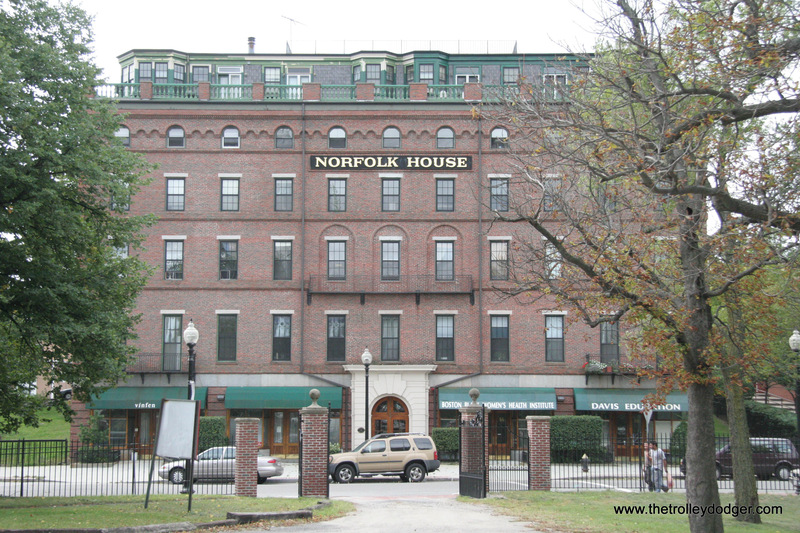 Norfolk House was built in 1853 and is also still standing. The four-and-a-half story building has now been converted to condos. 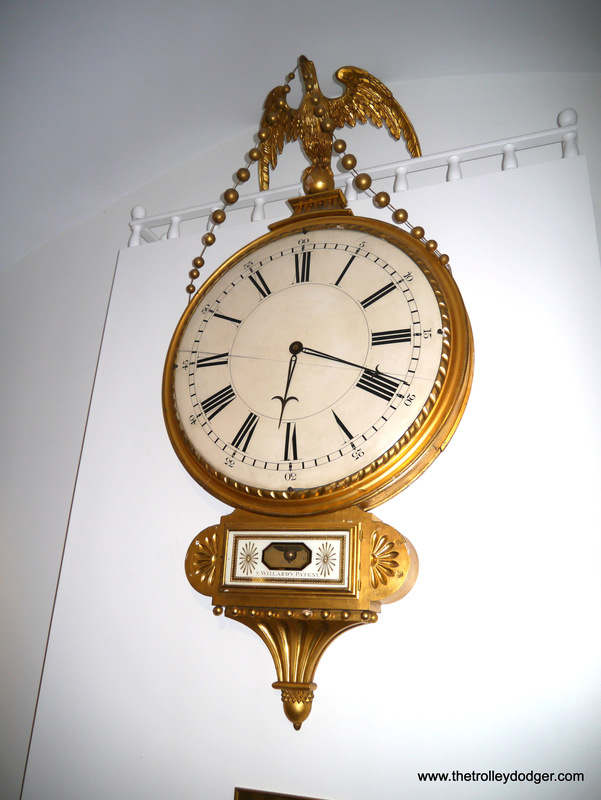 This early 19th century gallery clock is the original from the First Church of Roxbury, and is on loan to the Willard House. Meanwhile, an exact replica was made and hangs in the church. This January 1962 image shows DC Transit pre-PCC car 1053, just prior to the end of streetcar service in our nation’s capitol. 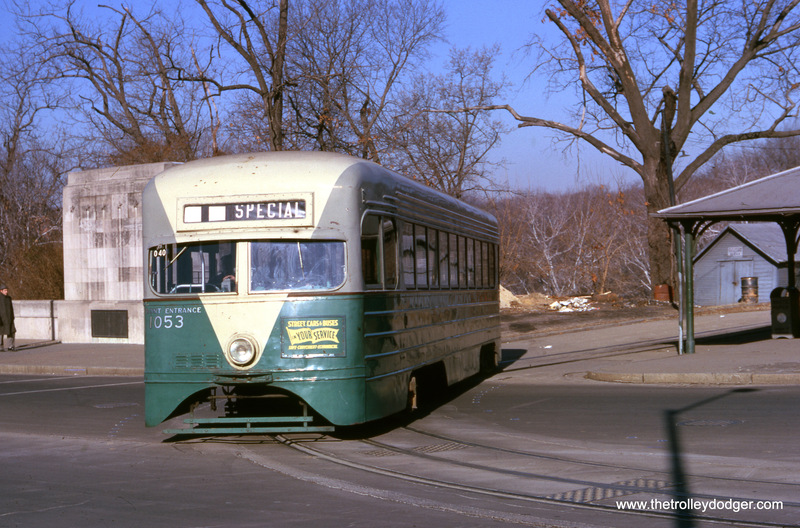 Unfortunately, this historically important streetcar was later destroyed in a fire at the National Capital Trolley Museum in 2003. 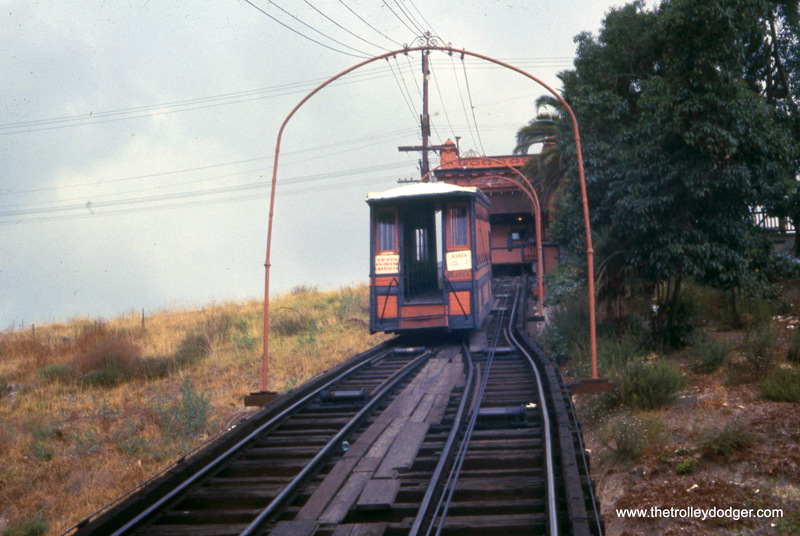 You might be mistaken for thinking this funicular was in a rural location, but this picture (and the next) shows the Angel’s Flight Railway in Los Angeles in August 1968. 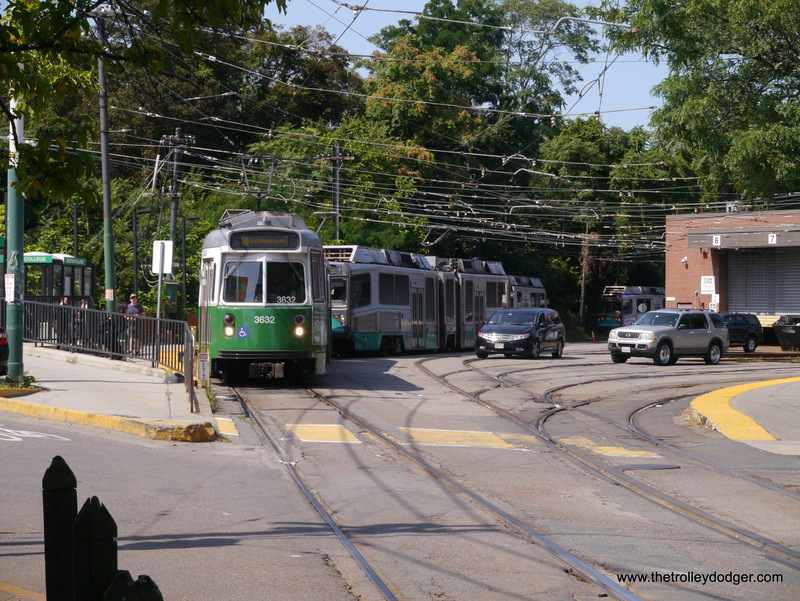 By then, much of the surrounding area in the Bunker Hill neighborhood had been cleared for redevelopment. 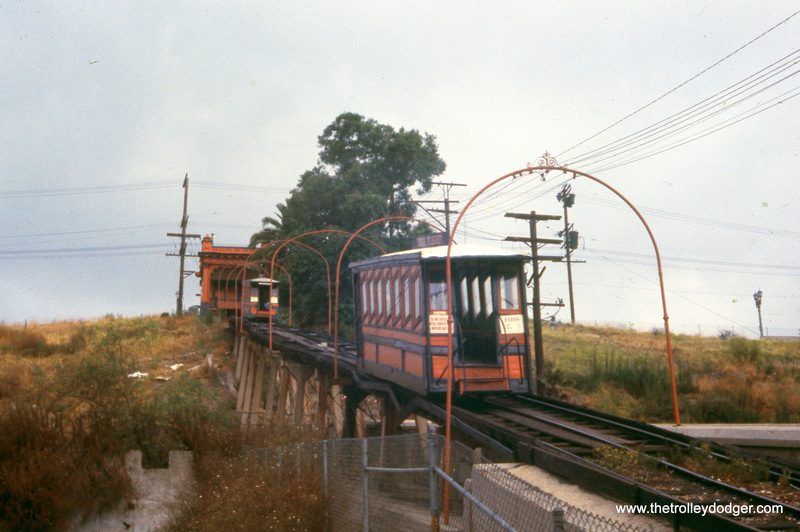 Angel’s Flight itself was dismantled in 1969, as part of the hill was leveled. After being in storage for many years, it was finally relocated and has now once again resumed operations, with important new safety features after a series of accidents. 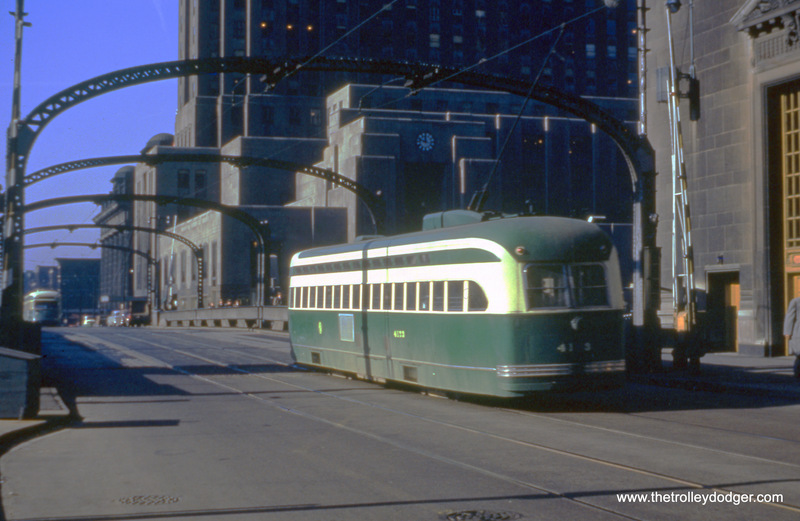 A postwar Pullman-built PCC prepares to cross the Chicago River on Madison Street, probably in the early 1950s. That’s the old Chicago Daily News building in the background. 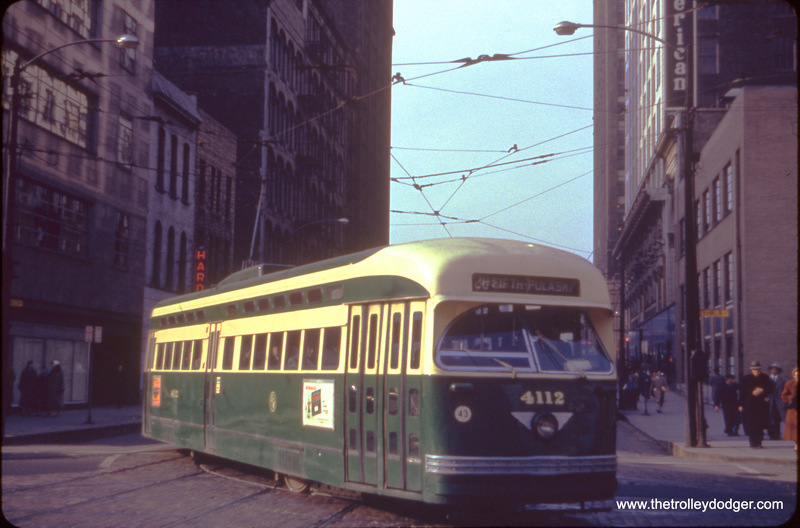 Postwar Pullman PCC 4112, signed to go west on the Madison-Fifth branch of Route 20, turns onto Franklin Street, probably in the early 1950s. 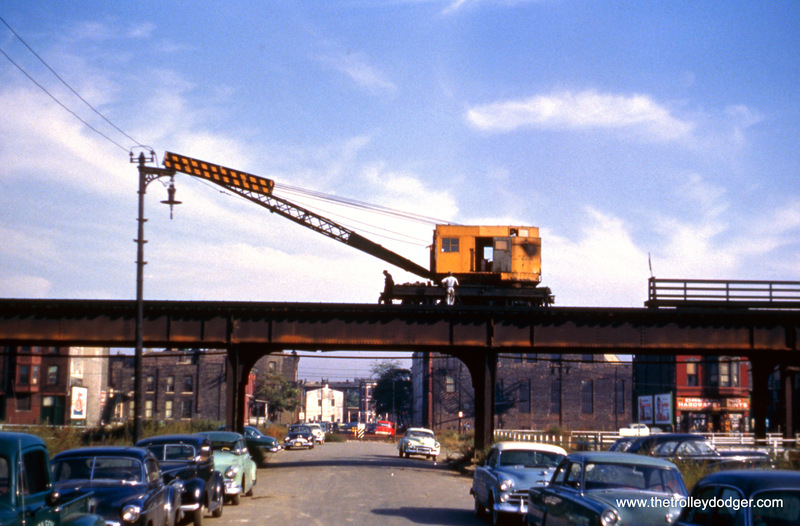 This picture shows a CTA crane in operation on the old Metropolitan or Garfield Park “L” in the early 1950s. You can see how many nearby buildings have already been cleared away in order to build the Congress Expressway. 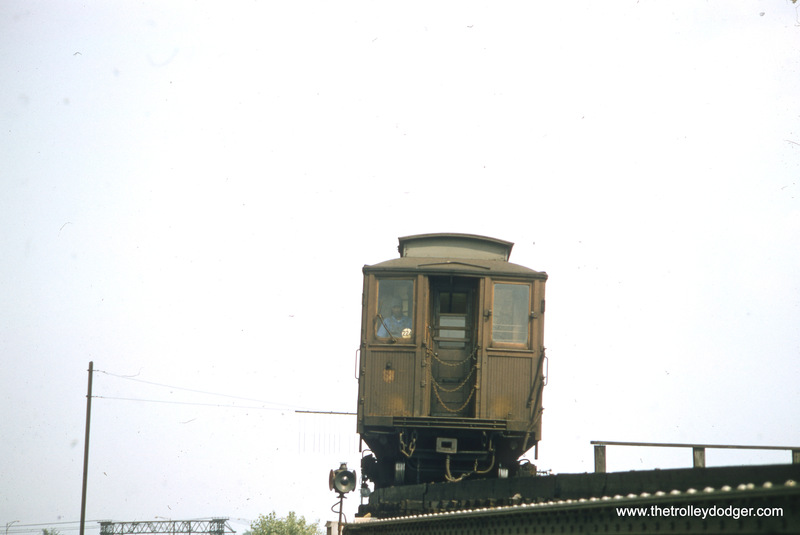 A wooden Met car on the CTA’s Kenwood shuttle in August 1957, just a few short moths before this branch line was abandoned. The CTA (and CRT before it) was a tenant and this complicated operation of the line. In addition, the CTA during this period closed several branch lines, in their efforts to consolidate and streamline service. This picture of CTA postwar PCC (built by St. Louis Car Company) at South Shops was probably taken at around the same time (and by the same unknown photographer) as the Kenwood picture, i.e. August 1957. The nearby bus is 3625. If the date is correct, all the postwar Pullmans had been gone from the property for more than two years already. Alderman Brendan Reilly (42nd Ward) is very pleased to announce that the final recommendation for landmarking the Quincy Elevated Station at 220 S. Wells Street was recently approved at the September 7, 2017 meeting of the Commission on Chicago Landmarks. Opened for service on October 3, 1897, the Quincy Elevated Station has served generations of Chicagoans and visitors to the City, and remains the best example of an original Loop “‘L’ Station. 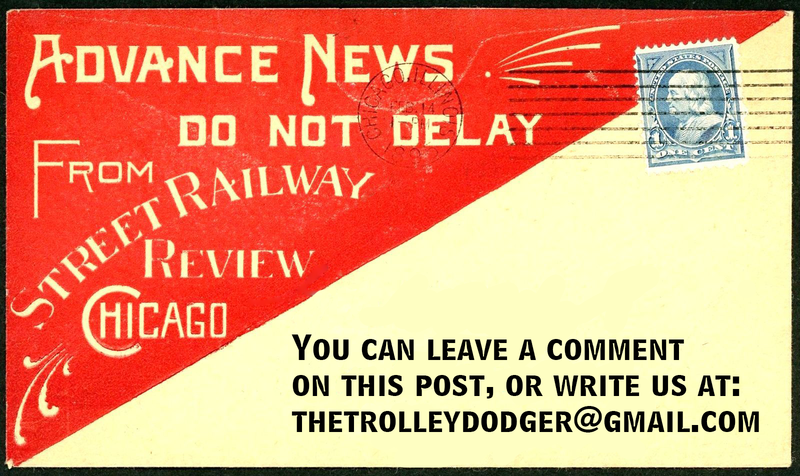 This is our 194th post, and we are gradually creating a body of work and an online resource for the benefit of all railfans, everywhere. To date, we have received over 320,000 page views, for which we are very grateful. 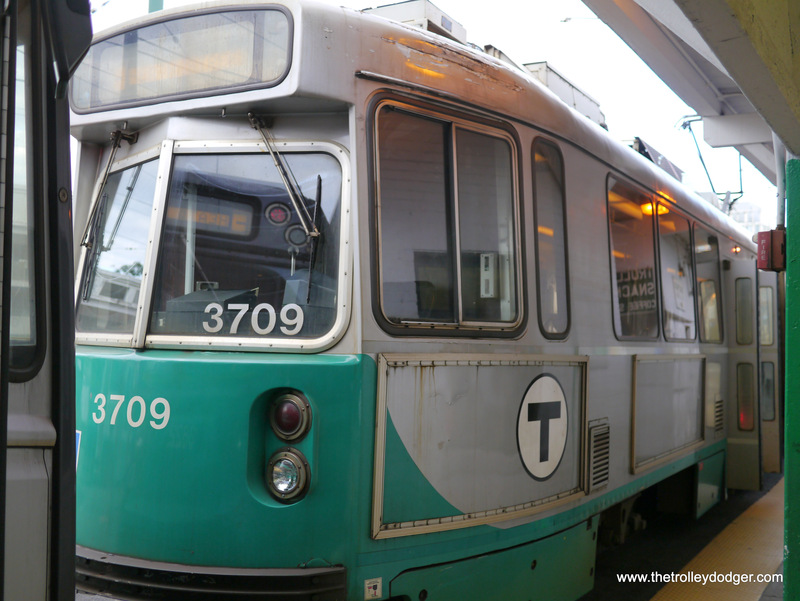 The T’s class 7 cars were built in a 1986 order followed by a smaller order in 1997 of the 3700 series. There was nothing said about the Boeing cars fiasco. 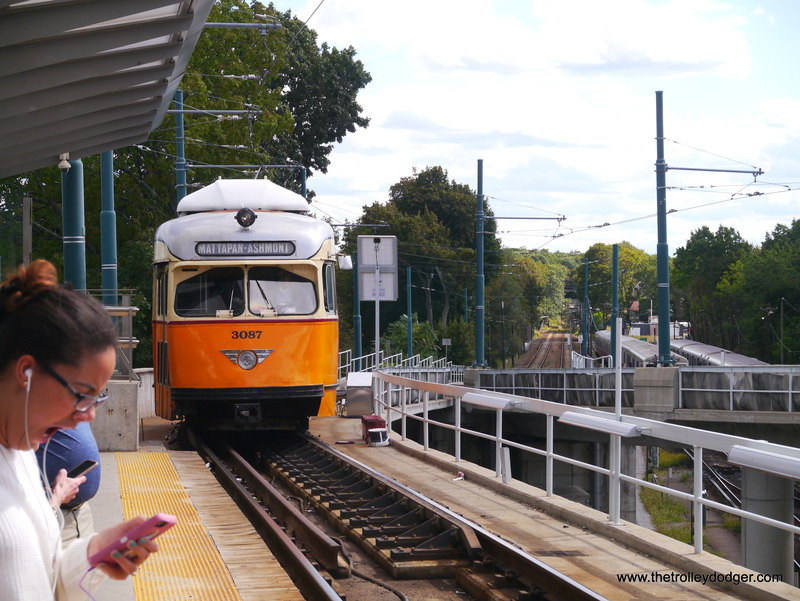 I might have missed it but not a word regarding the D or Riverside branch of the Green Line purchased by the then MTA of the former B&A commuter line where two of the former stations remain as historic buildings. Also missing was mention of Riverside yard. 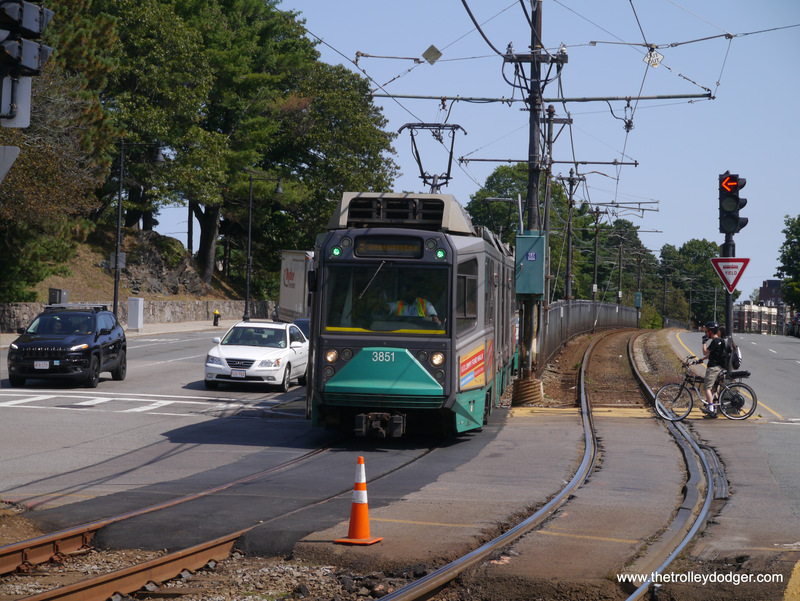 The E line extension is being started, so I have been told. 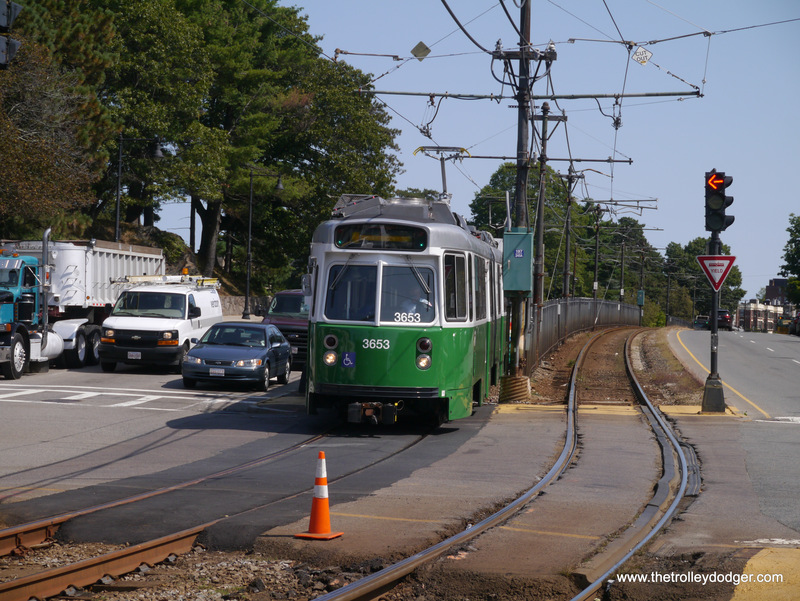 The Mattapan cars were out of service as was the line during the upgrading and installing of air conditioning. I rode the line in 2009 where we roared along at 35 mph! The historical importance of the Park or Pahk street station is key as that represents part of the oldest subway in America. 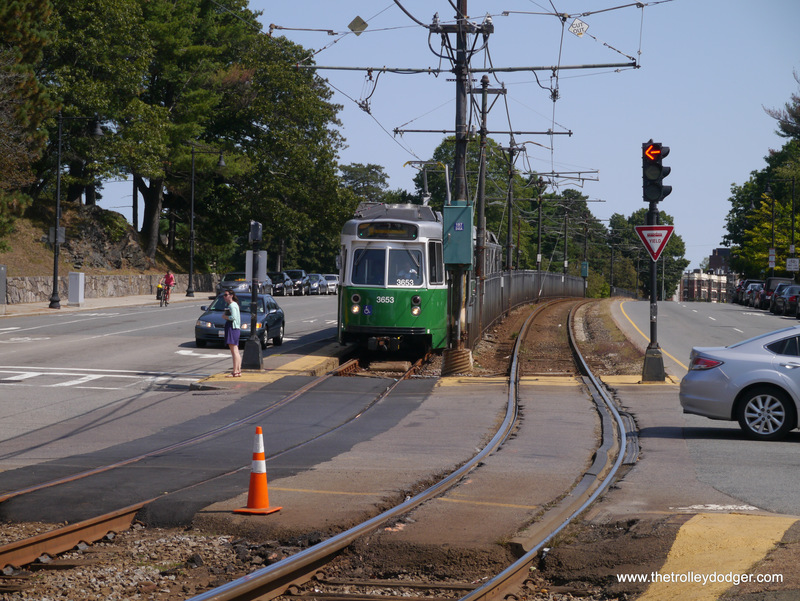 For those interested they become members of the BSRA Boston Street Railway Association, Inc for $25 a year which includes their bi-monthly magazine. 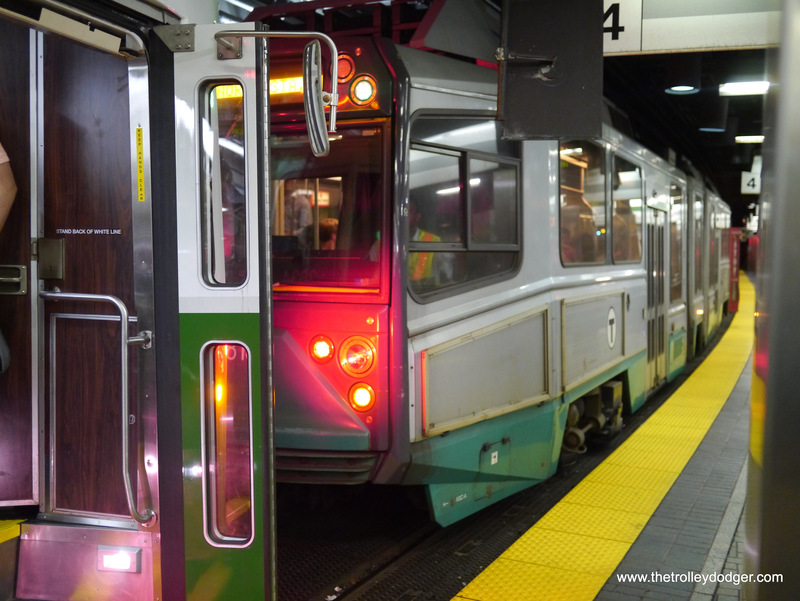 For those wanting more information on the “T” including photography of each light and heavy rail route as well as shots taken from the observation deck of the Pru please go to my website http://www.umcycling.com and click on the MBTA link. You’re welcome to download but all photos fall under the copyright law which is enforced. 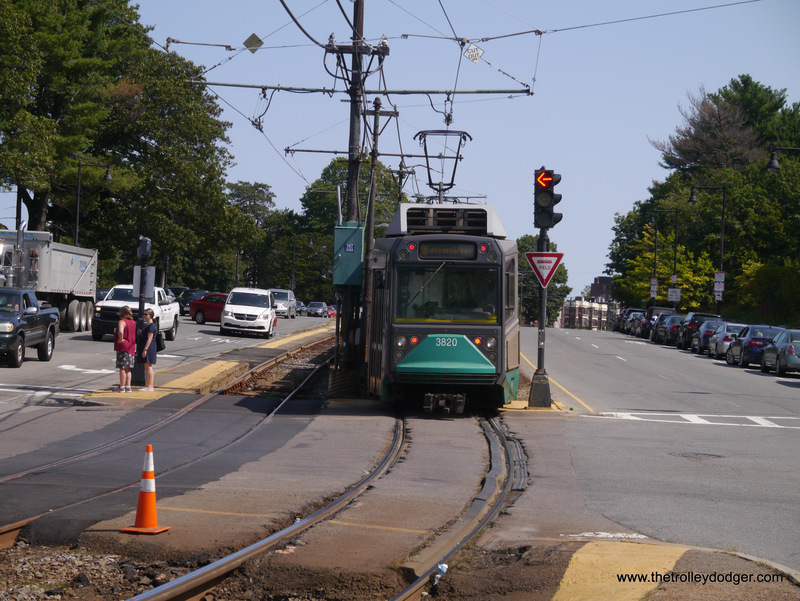 Thanks to the MBTA for their cooperation. 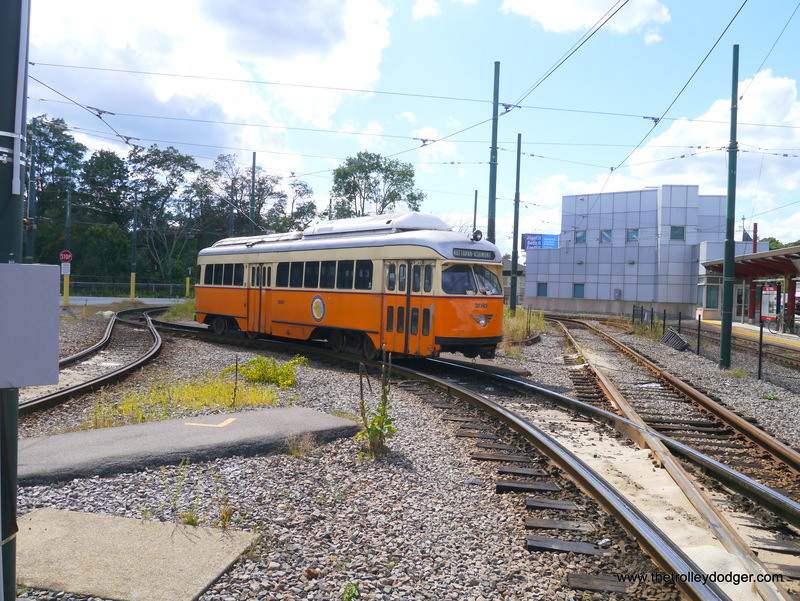 My trip was too short to allow for riding and photographing all the lines this time; however, I did at least mention the Riverside Line in passing in one of the photo captions about Ashmont-Mattapan. 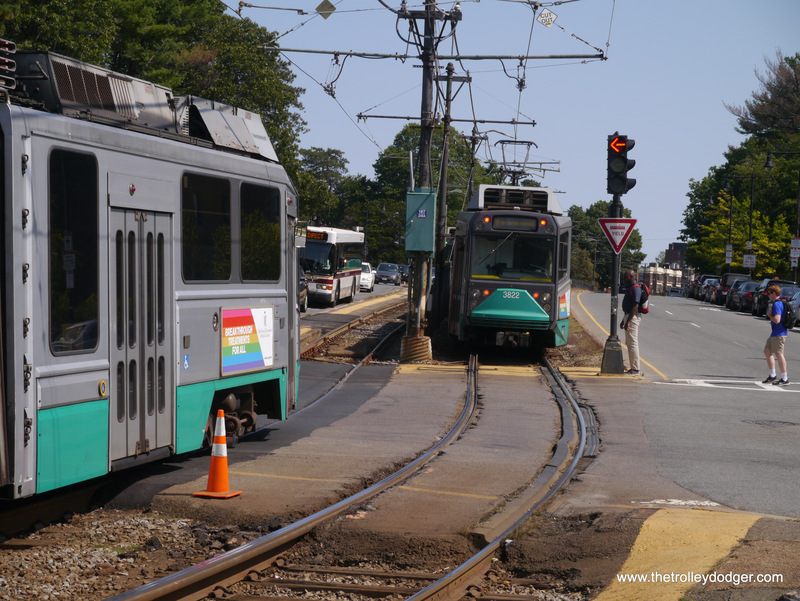 If the Boston PCCs have air conditioning, it wasn’t being used during this trip or the last time I rode them in 2014. But it wasn’t all that warm, either. Boston is the kind of city you may leave behind but it never leaves you. I was there on vacation in 2007, 2008 and 2009 during the fall season. I drove there so I was not limited to what I could cover., I found the employees great, I bought a Charley pass (let’s test your origin on that one!) which was very reasonable. I do not know if they were still around when you were there. I did have a letter from the public affair department in case there were any photography issues which there were not. 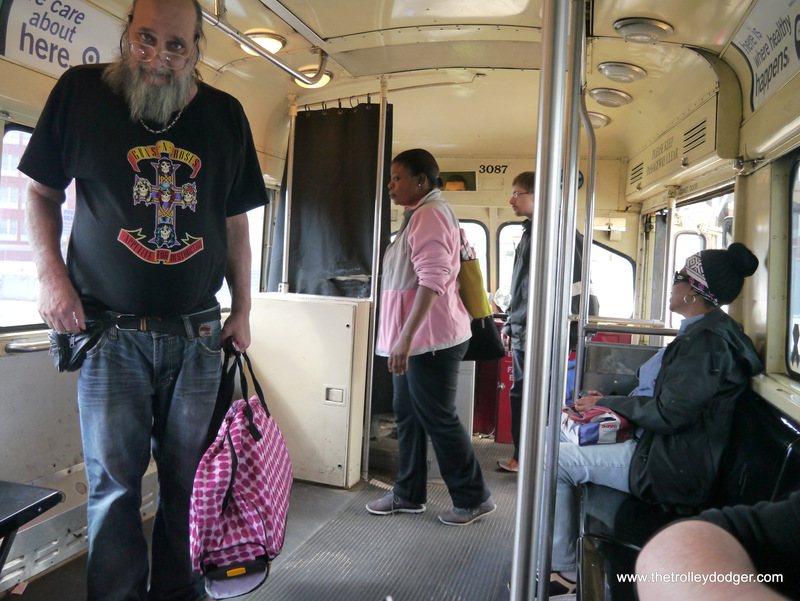 Of course wearing a Metro Transit light rail tee shirt did not hurt either at times. I found the sups at Wonderland on the Blue Line extraordinarily nice. I also had my ID card at all times. Of special interest was the time I spent in the Mass Transportation Library at MBTA HQ. 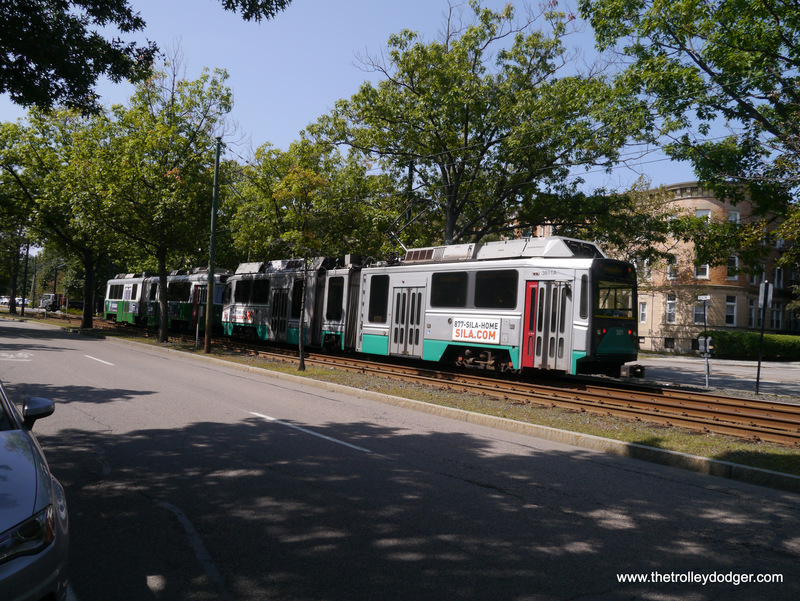 While I will be going to check the photos on my website in the MBTA session for re-mastering you are more than welcome to use any with proper copyright. My Boston works also appeared in the BSRA magazine including a cover shot. Nice photos, by the way. Very familiar areas! “M.T.A.”, often called “The MTA Song”, is a 1949 song by Jacqueline Steiner and Bess Lomax Hawes. Known informally as “Charlie on the MTA”, the song’s lyrics tell of a man named Charlie trapped on Boston’s subway system, then known as the Metropolitan Transit Authority (MTA). The song was originally recorded as a mayoral campaign song for Progressive Party candidate Walter A. O’Brien. A version of the song with the candidate’s name changed became a 1959 hit when recorded and released by the Kingston Trio, an American folk group. The song has become so entrenched in Boston lore that the Boston-area transit authority named its electronic card-based fare collection system the “CharlieCard” as a tribute to this song. 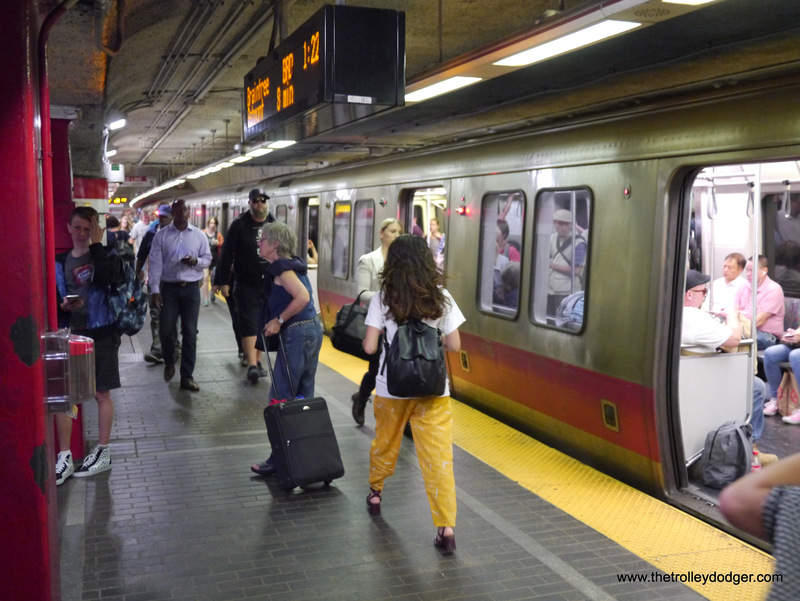 The transit organization, now called the Massachusetts Bay Transportation Authority (MBTA), held a dedication ceremony for the card system in 2004 which featured a performance of the song by the Kingston Trio and then-governor Mitt Romney. 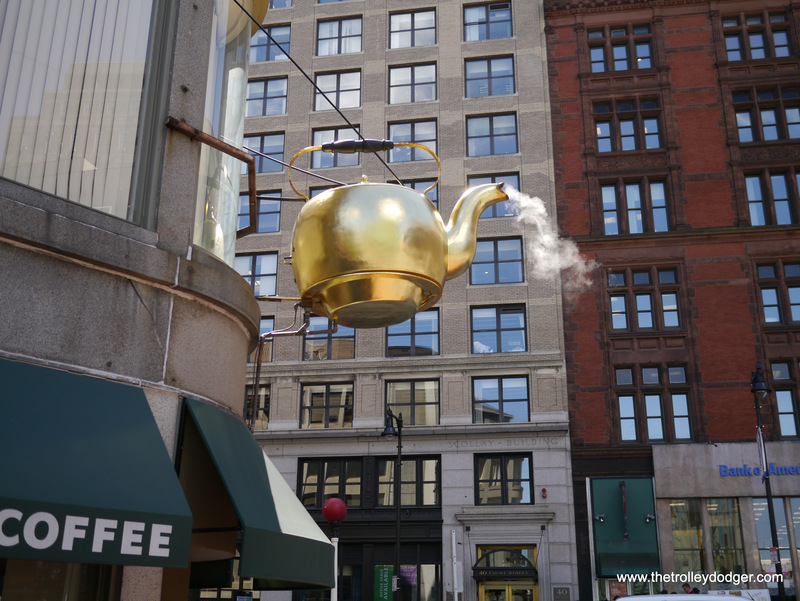 Your series of pictures of Boston brought back memories of past trips. 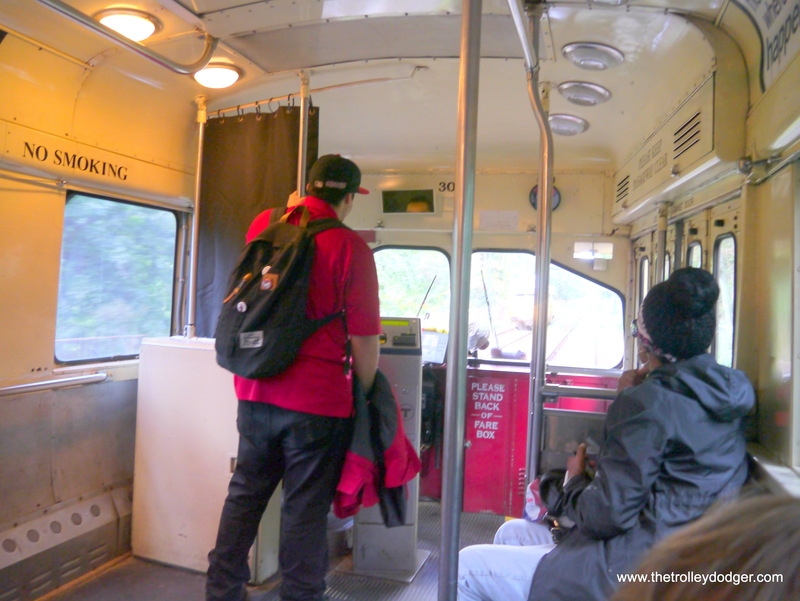 My first one was in April, 1980, and in subsequent visits, I managed to ride the “wartime” PCC’s (3022-3196 and 3222-3271) and the Picture Window PCC’s. 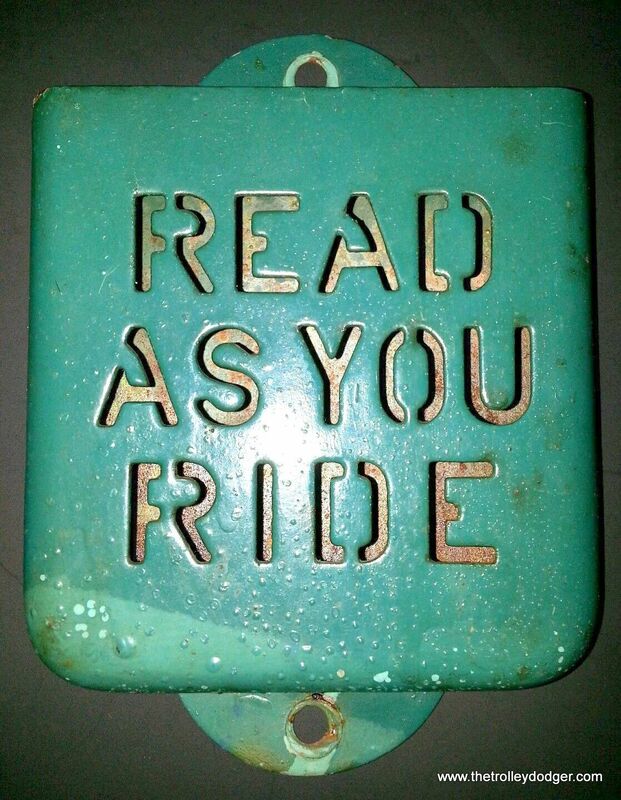 Of course, I’ve ridden the successors, as well. My last visit was last March, in brutal cold, so I didn’t venture too far from my hotel. The last visit for me with some riding was at the end of April, 2016, in conjunction with a conference given by the Rail Users’ Network…got some rides in on that trip. for those who want more and as part of a project to preserve my photos I am making avaliable at cost a DVD of all of my Boston photos if interested contact me at accessys@smart.net. San Francisco, and Philadelpia are almost done with Chicago and Pittsburgh to follow. other cities as I get the slides and photos scanned. there are over 1,100 photos on the Boston disk from 1974 to present. this is one way I am attempting to preserve my many years of rail photography for future generations. if others decide to do something similiar I will do a mine for yours even swap making money is not the object in fact some of the photos are pretty poor but there are some real winners too it is my entire collection on one disk. 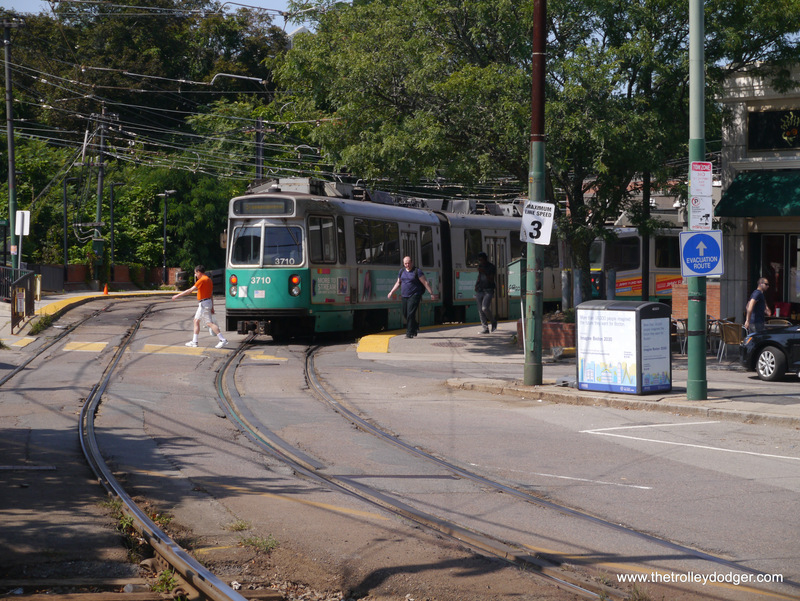 When I visited Boston in 2007 the Mattapan-Ashmont line was closed for renovation. 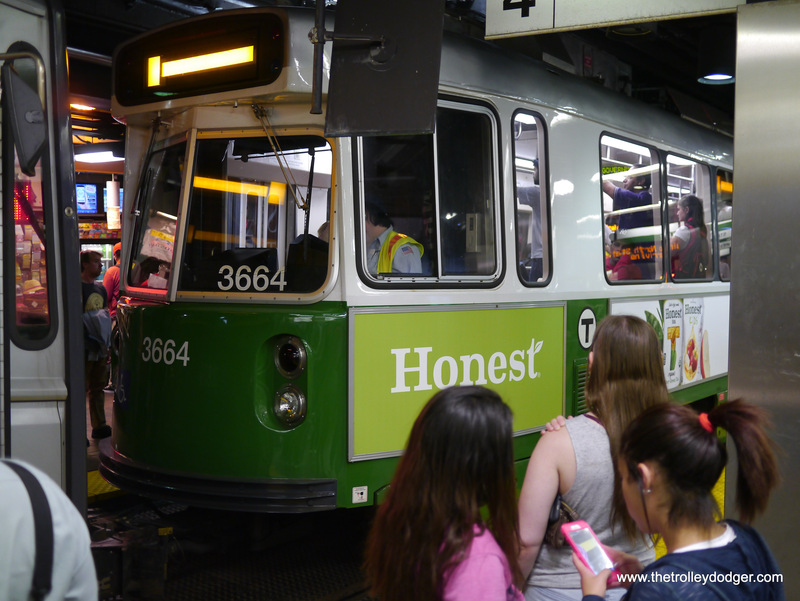 I hope you got to ride one of the ETB lines at Harvard Square (if you like trolley buses). 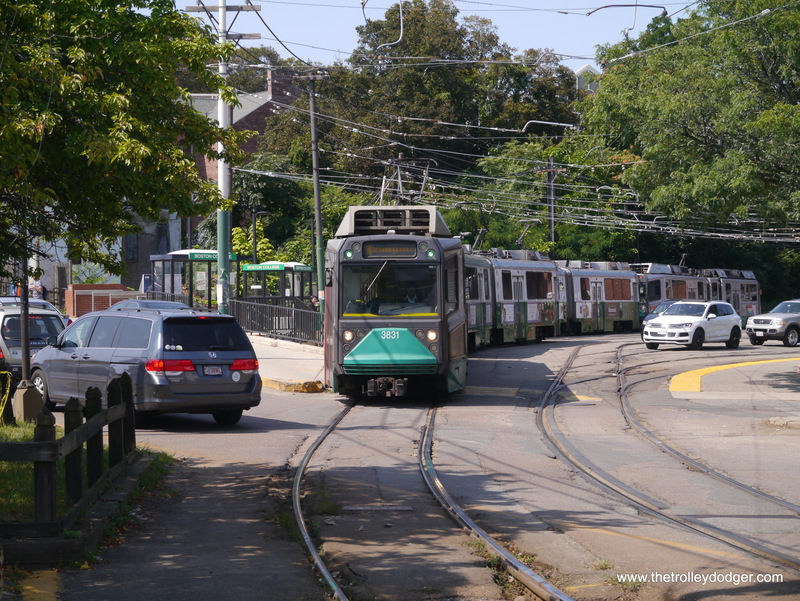 While there did you hear anything about the forthcoming Type 9s for the Green Line? 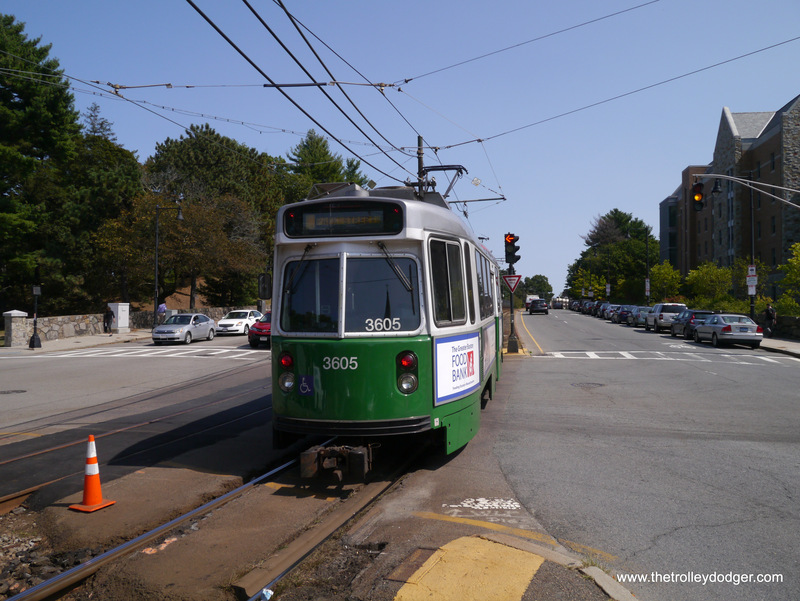 I rode some trolley buses on my last trip… saw lots of them this time, but didn’t ride. 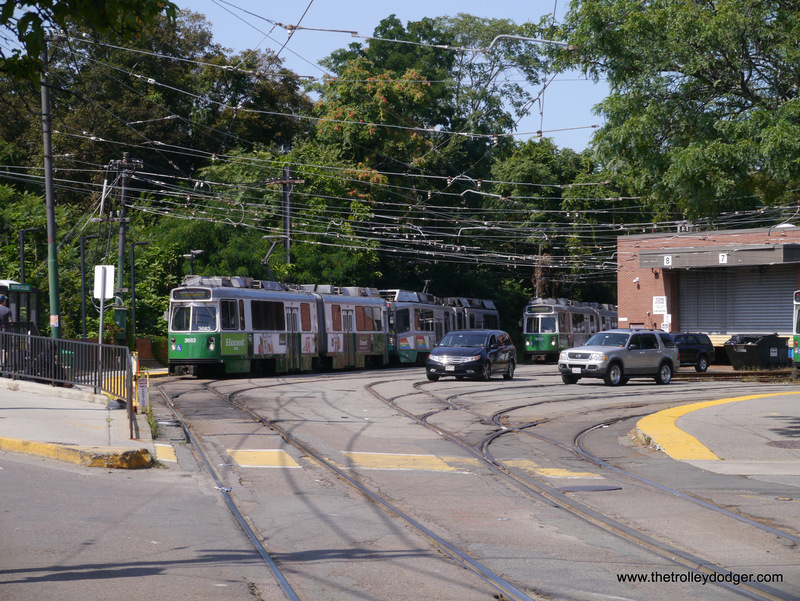 The EBT line is on Mass Ave. I did get some photos of them in action during my third visit in 2009. They’re on my website: http://www.umcycling.com I think in the bus section. 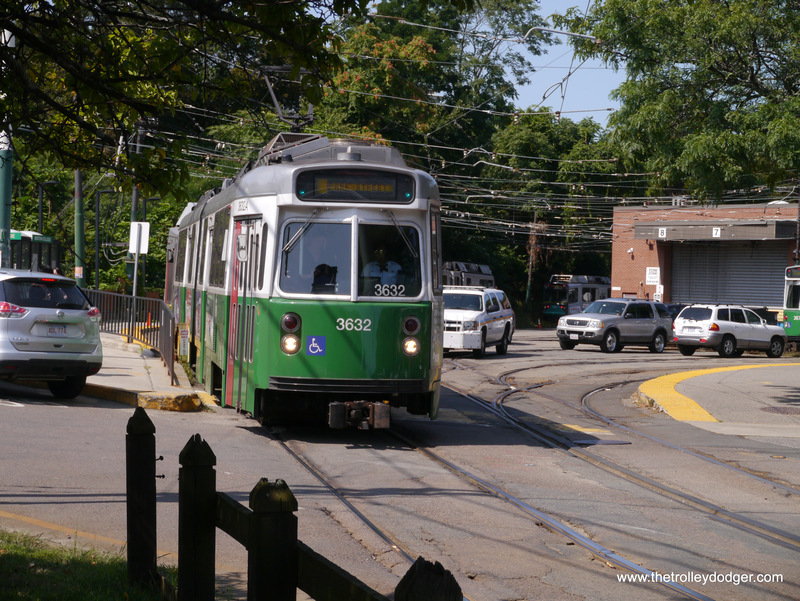 Click on the MBTA photo on the home page. I did notice a few links that are not working. The website itself covers three separate and independent websites. If you click on the middle link on the home page you will go to the TOC. David: feel free to use what you wish from the website including the MBTA but my copyright must appear on the lower right side of each photo for intellectual property rights. I also have posted photos on Facebook that I have re-mastered. The BSRA bi-monthly magazine has had extensive coverage of the Type 9 as well as the new cars for both the Orange and Red Lines. Photos of the mock-ups were in the magazine that were quite interesting. I am not going to go into the specifics right now as it is time to get some sleep. The type 9 cars will probably be use on the E branch extension which is under construction. They will NOT be compatible with the earlier series which, in my opinion, may not be that good of a move as far as flexibility goes. 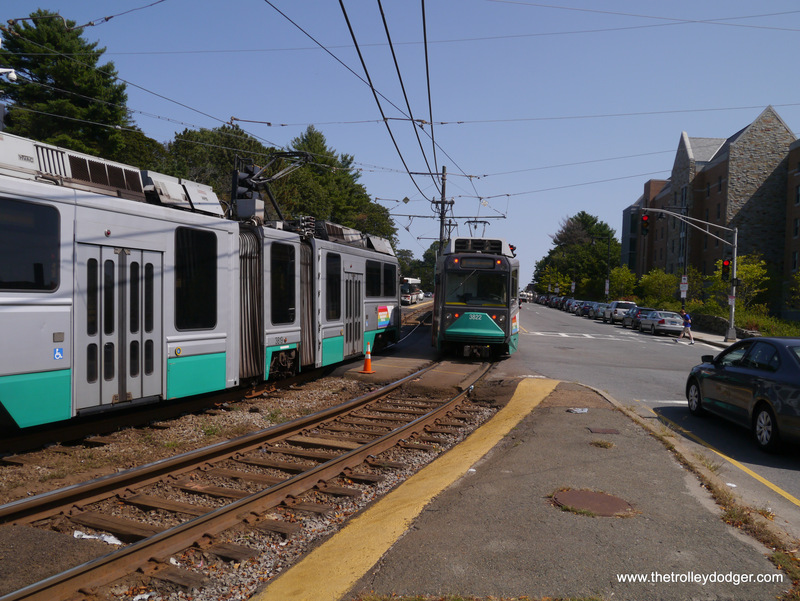 As for the Orange and Red Lines the new cars will most likely replace the earlier Red Line cars (maybe the 01800 series too) and the Orange Line cars. That being done the oldest cars will either be the 01800 series or the 0700 cars of the Blue Line which were delivered in 2007-08. Hi David — if you are looking for material, I was in San Francisco three weeks ago. Here’s a flickr file of photos, each one has a caption attached to it. If you need material, you are welcome to use these for a Trolley Dodger edition, just put on the site that they cannot be reproduced or used without permission. DC Transit 1053 (St. Louis Car pre-PCC) is on the Calvert Bridge loop terminal conduit trackage immediately east of the then Calvert Bridge*. 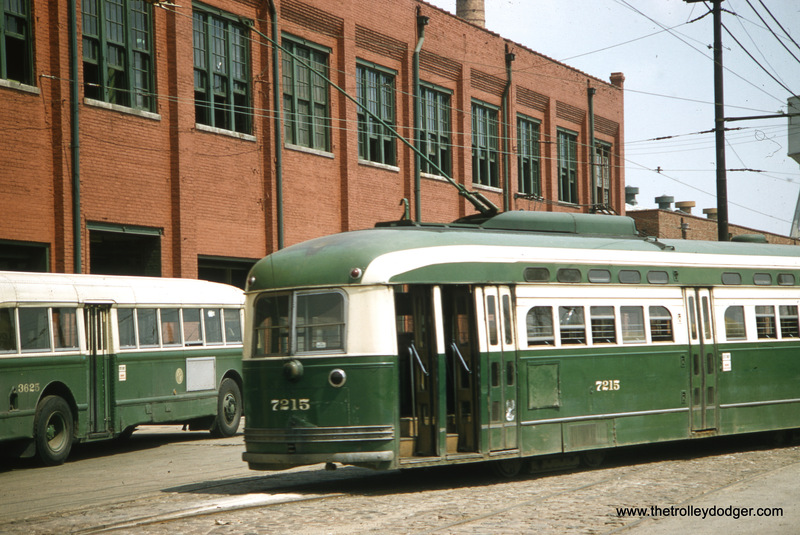 This was the west terminal loop for revenue streetcar service routes 90 Calvert Bridge to 17th and Penna. Ave. @ Barney Circle SE. and Calvert Bridge 92 Navy Yard via Florida Ave. This terminal is still used as an ‘end of line loop’ for the rt. 90 Metro bus. *In 1974 the Calvert Bridge was renamed to honor Washington born musician: Duke Ellington. I recently discovered your blog/website while researching something else for a fellow transit modeler, which meant saving a favorite for further reading and enjoyment. Like him I also model in the virtual world, which means we can recreate routes that have long been abandoned as well as those that are still in operation. 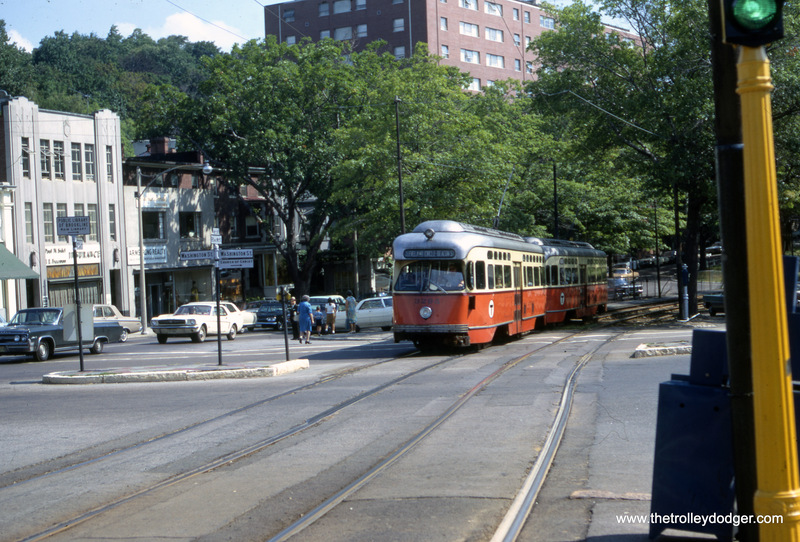 The 1967 view of Beacon Street gave me flashbacks. I was 6 years old at the time that picture was taken and used to ride those trolleys. The old venerable PCCs were to me what represented Boston. 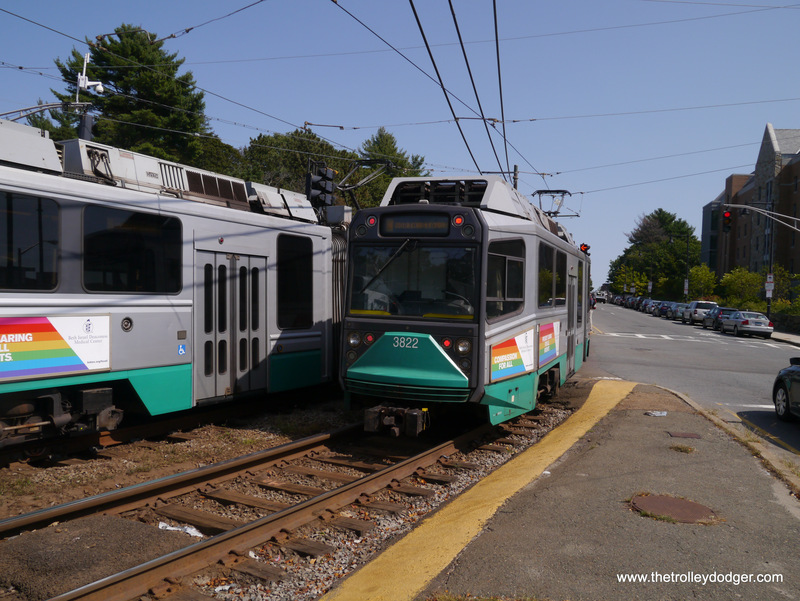 They have a distinct sound and personality to them, which has been lost with the new LRVs we use today. I grew up north of the city and would travel into Boston regularly and then over to Cambridge to visit my grandmother. I was in tow of course with mom gripping my hand, but it meant taking the Budd Liners (RDCs) from Bradford (Haverhill, MA) to North Station then switching to the trolley to Park Street where we then switched to the Cambridge subway (Red Line today) to Central Square where we would then walk to her apartment. 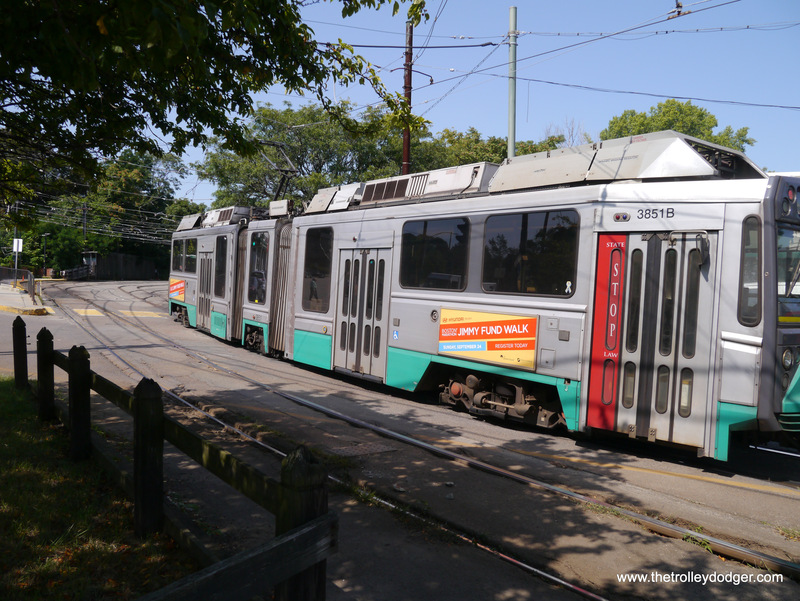 Other trips including taking the trolley or subway to other parts of Boston to visit family friends, or to Children’s Hospital out on Longwood Avenue, which mean street running rides and standing in the awful cold as we waited for a trolley car to come along for the trip back. 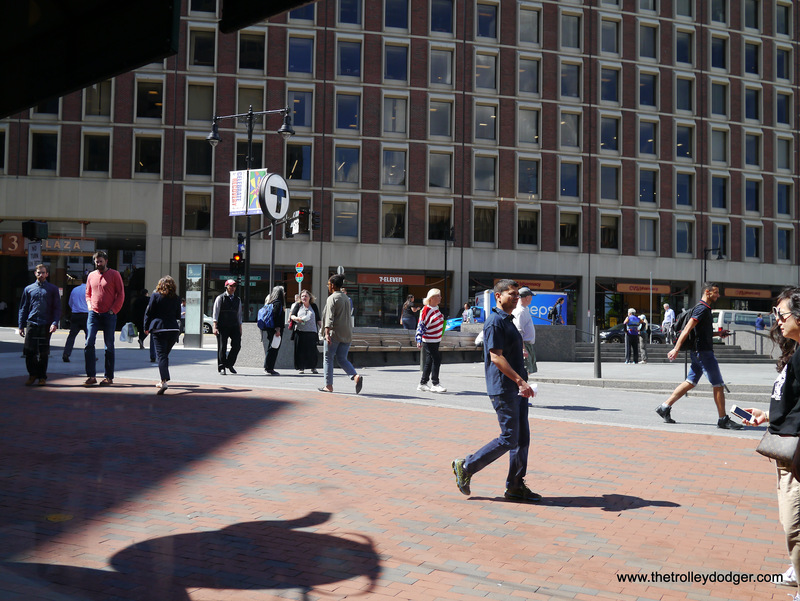 My dad also worked in Boston on Boylston Street and we would travel over to visit sometimes for lunch while visiting with my grandmother, or I would take the trip into work with him on school vacations. He was a graphic artist and I would spend the day drawing trains and cities. One day my dad brought me for a ride I would never forget. This was in the summer of 1969. 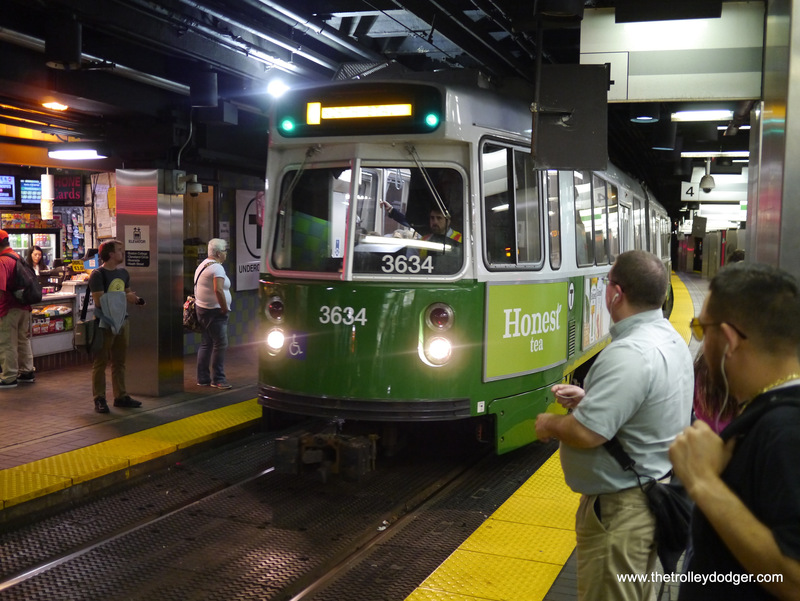 We took the trolley from Copley Square to Park Street where we walked through the concourse to Washington Street (Downtown Crossing), and we then took what was then the EL towards Forest Hills. My dad and I sat up front in the lead car where I could see the tracks in front. Soon we were up on the Mainline and rattling south to Forest Hills. 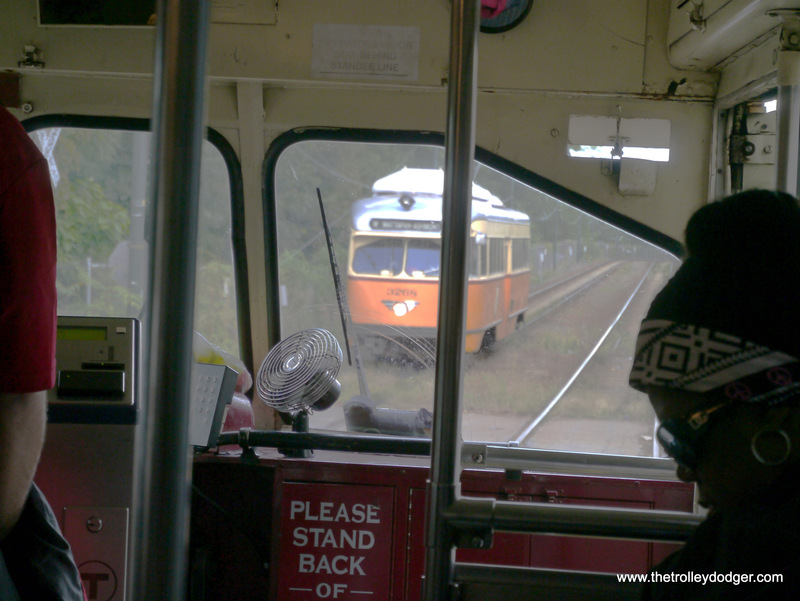 The motorman was kind and let me into the cabin where I could watch the tracks ahead and see the switches and signals. 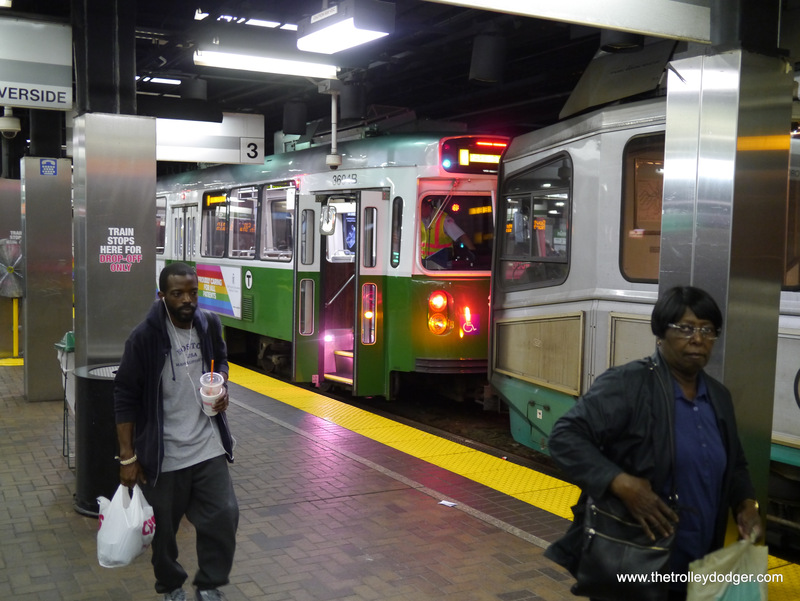 When we reached the end, we switched trains and headed back to Sullivan Square, turned around, then got off at North Station to head home. 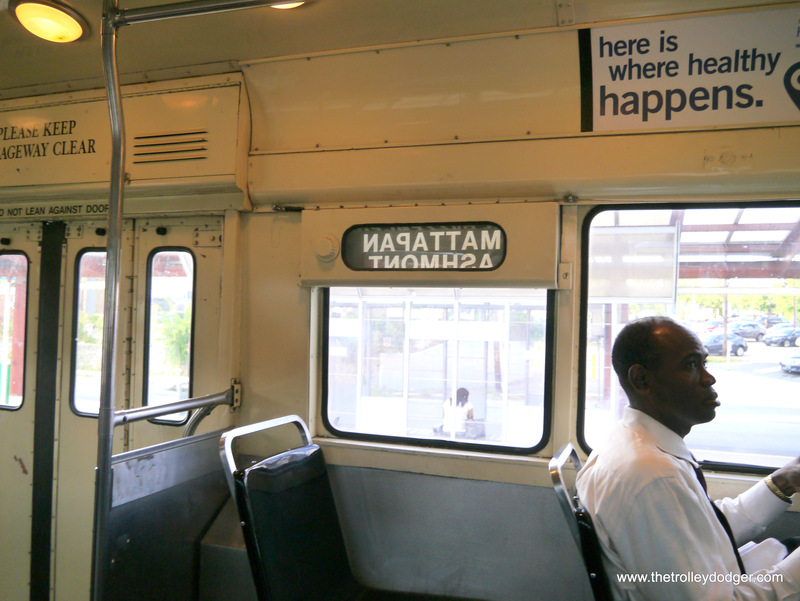 Little did I know then that in a few short years the EL would be gone and the system would be changed forever.